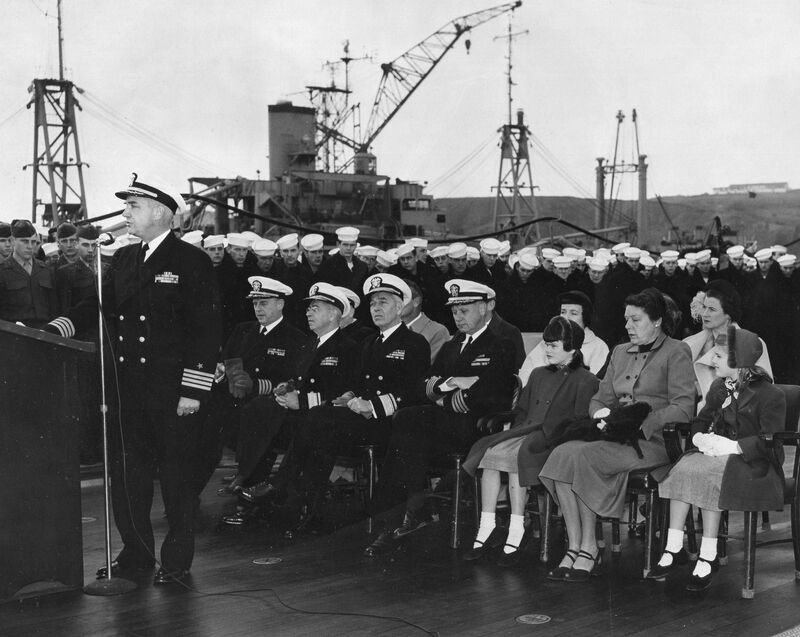 USS Los Angeles (CA 135) commissioning ceremony, 22 July 1945. 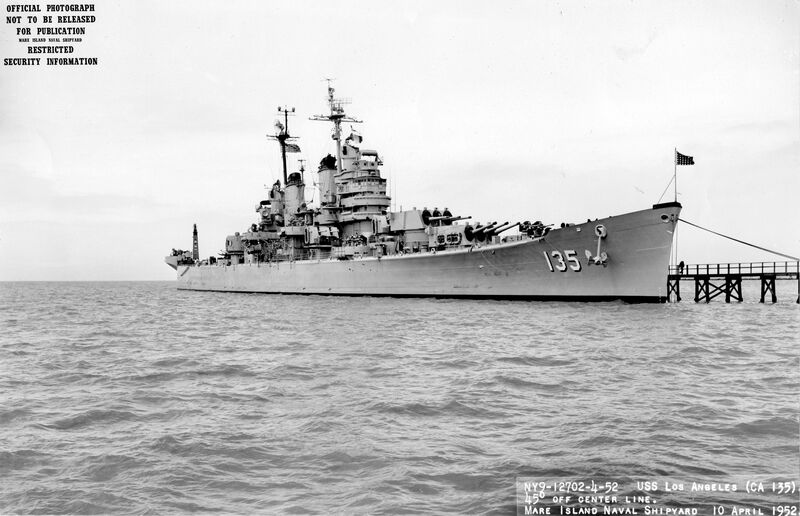 USS Los Angeles (CA 135) "The first phase of reactivation work began today (Tuesday, December 5) aboard the heavy cruiser USS Los Angeles (CA 135) at the San Francisco Naval Shipyard. 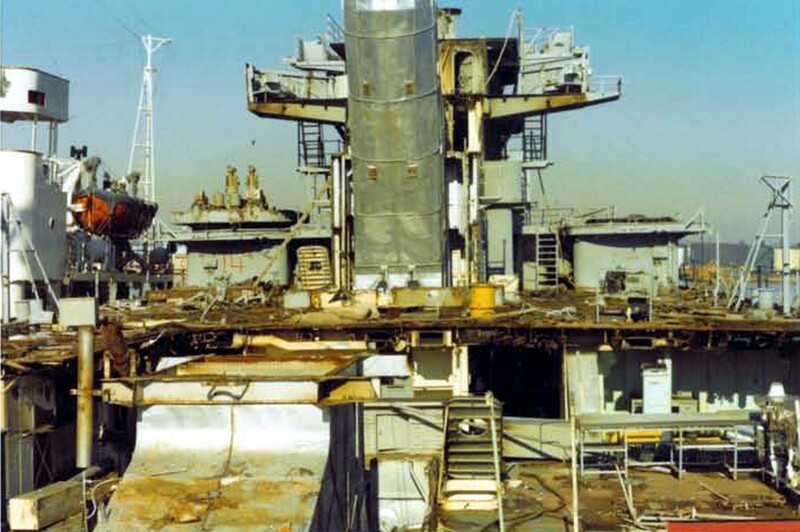 Today, Yard workmen removed the ship's gun covers and prepared for all-out reactivation. 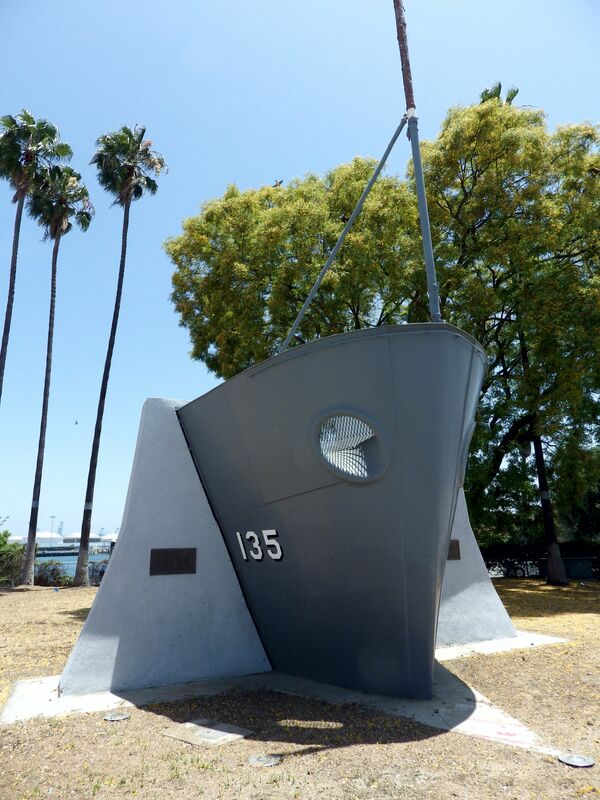 When the ship is re-commissioned, probably during mid-January 1951, special ceremonies will be held and it is hoped by local Navy officials that the Honorable Fletcher Bowrow, Mayor of Los Angeles, will be present." Text quoted from the original photo caption, which was released on 5 December 1950. 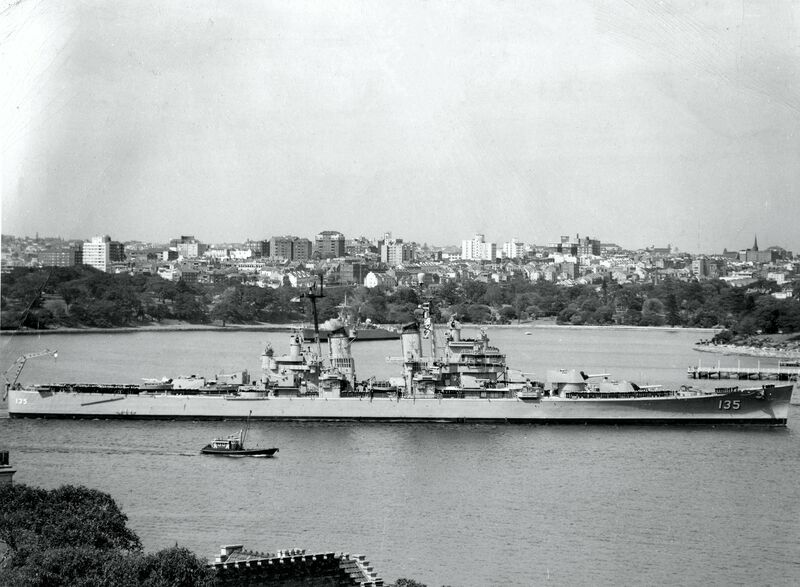 The ship recommissioned on 27 January 1951, following reactivation work at Hunter's Point, San Francisco, California, where this photograph was taken. 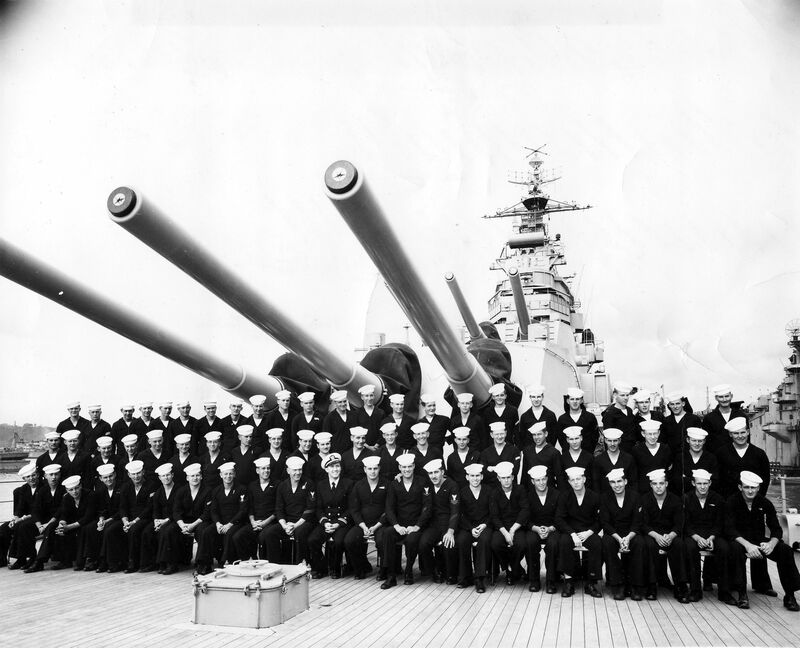 Official U.S. Navy Photograph, from the collections of the Naval Historical Center #NH 97390. 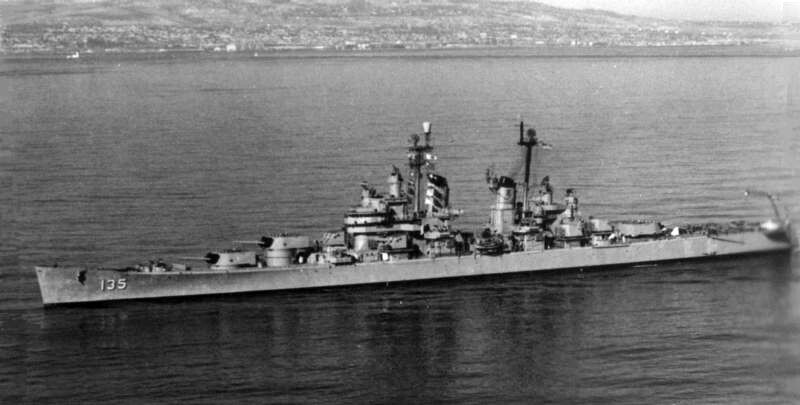 USS Los Angeles (CA 135) Photographed 21 March 1951 by PH1c Cooper. 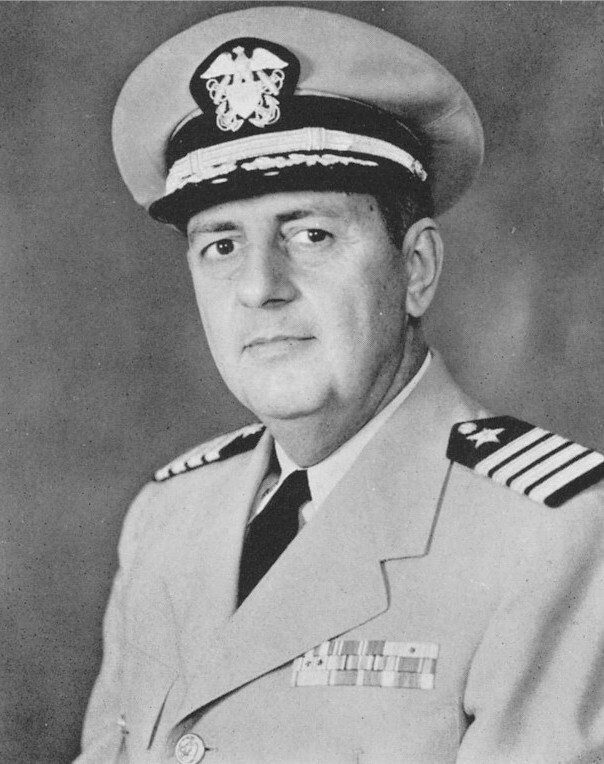 Collection of Admiral Arleigh A. Burke, USN. 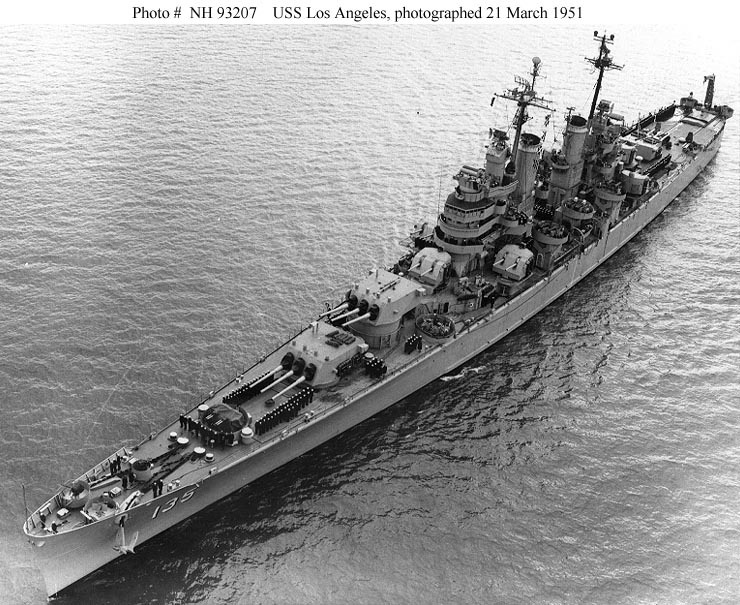 Official U.S. Navy Photograph, from the collections of the Naval Historical Center #NH 93207. 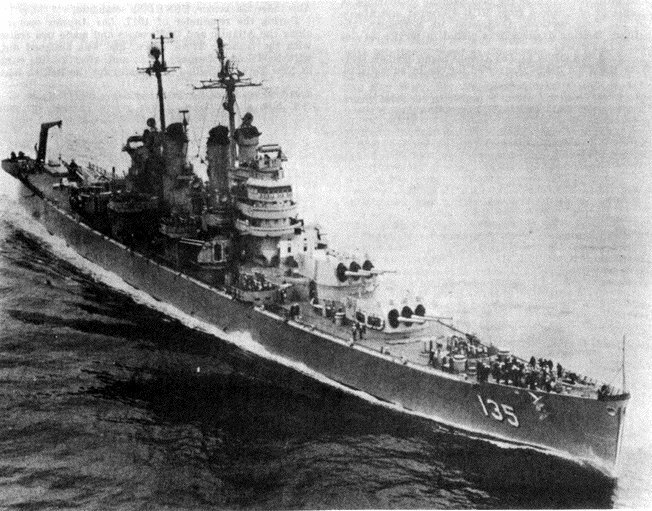 USS Los Angeles (CA 135) Fires a 5"/38 gun during a bombardment of Wonsan harbor, Korea, circa mid-1951. 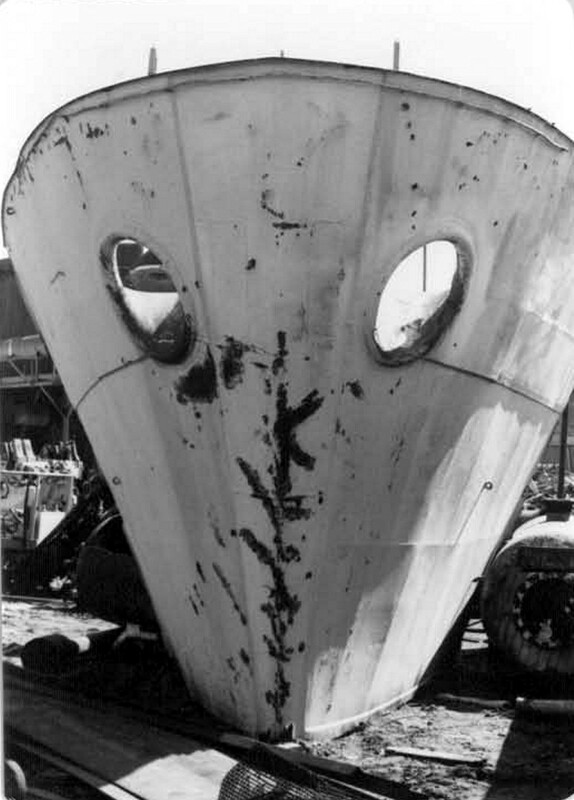 Note smoke ring, a feature frequently seen when firing 5"/38 guns. 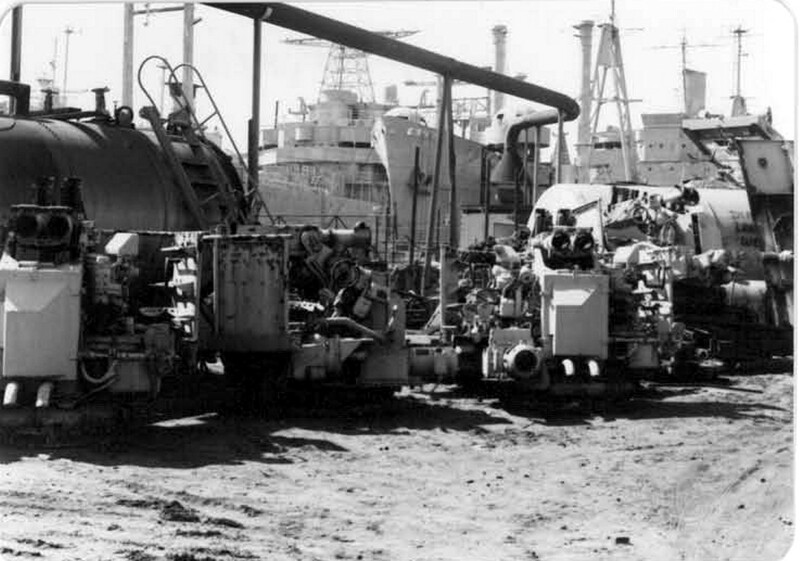 Some of the cruiser's 40mm guns are in the foreground. Official U.S. Navy Photograph, from the collections of the Naval Historical Center #NH 97393. 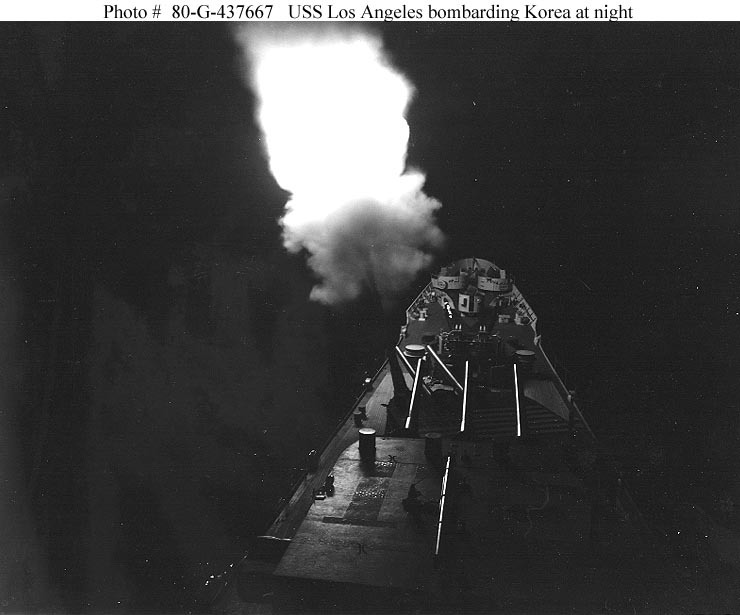 USS Los Angeles (CA 135) Fires her forward 8-inch guns during a night bombardment of the North Korean coast. Photograph is dated 8 June 1951. 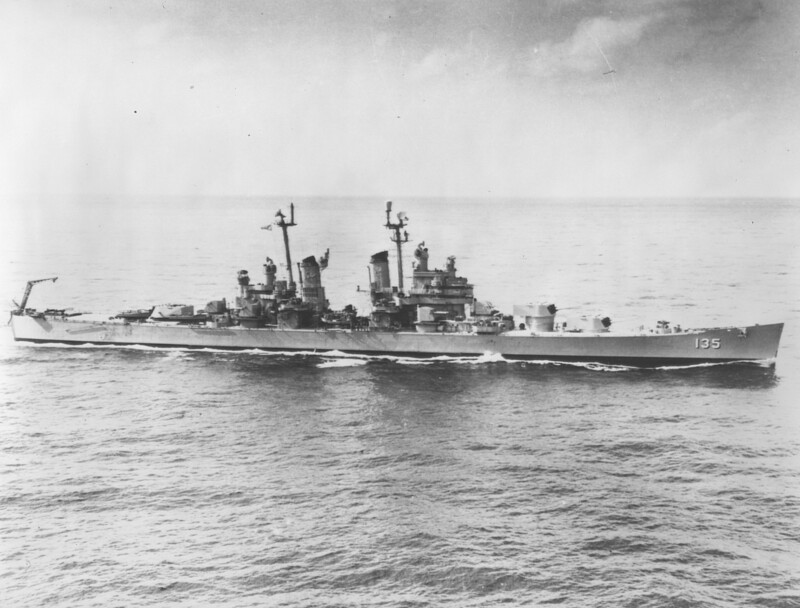 Official U.S. Navy Photograph, now in the collections of the National Archives #80-G-437667. 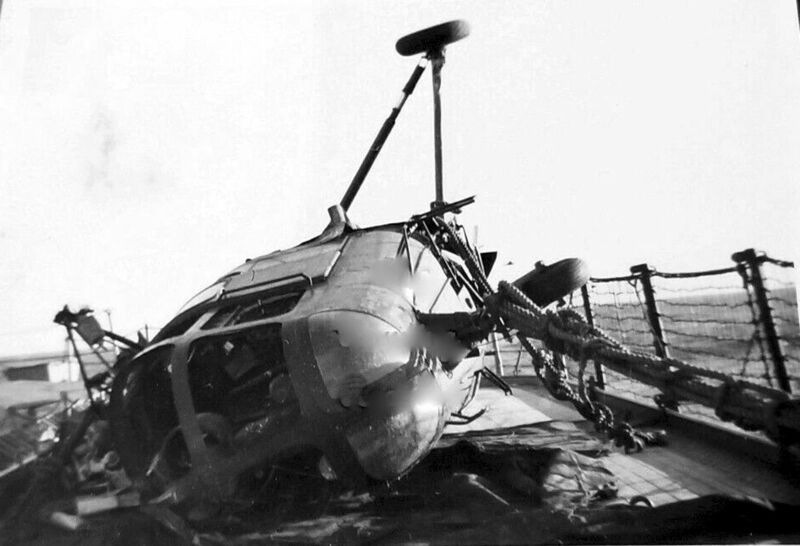 On board USS Los Angeles (CA 135) after a Sikorski H03S-1 Helicopter crashed while landing on the ship with Rear Admiral Arleigh A. Burke, Commander Cruiser Division Five, and Lieutenant General James A. Van Fleet, Commanding General, Eighth Army, aboard, circa June-July 1951. No one was injured in the accident. 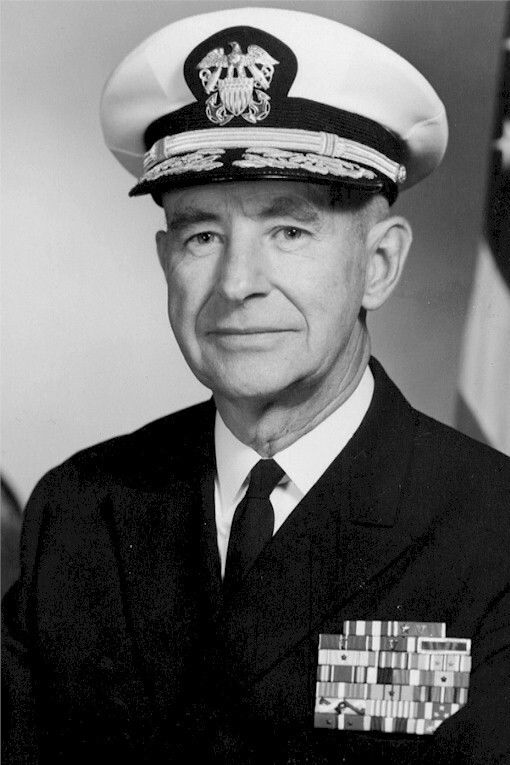 Donation of Admiral Arleigh A. Burke, USN (Retired), 1969. U.S. 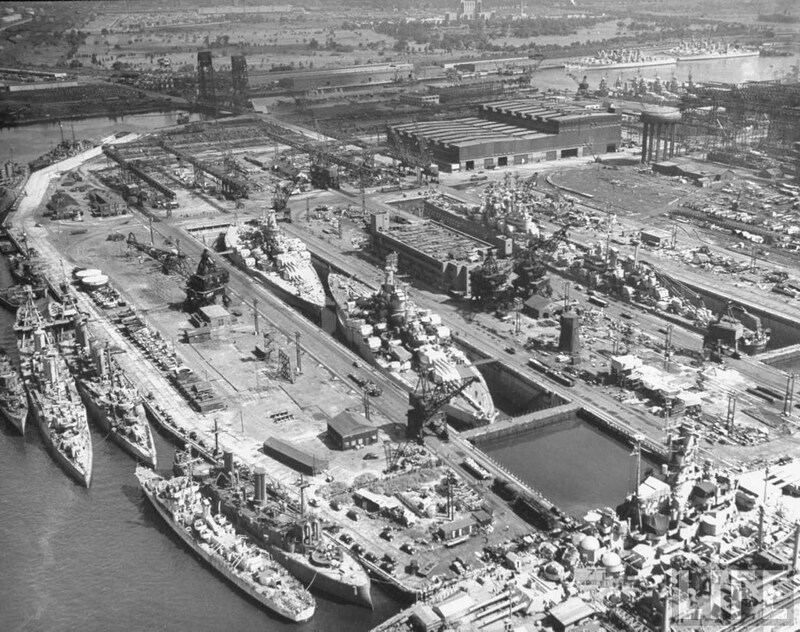 Naval History and Heritage Command Photograph #NH 66526. 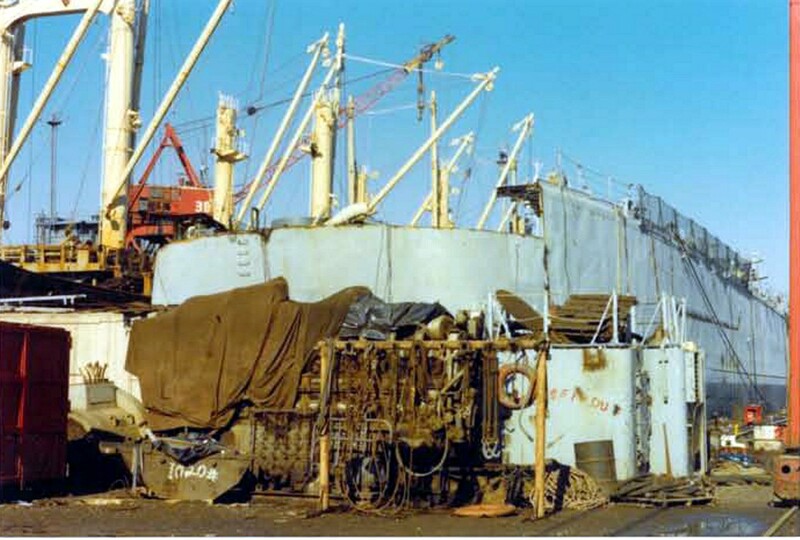 On board USS Los Angeles (CA 135) after a Sikorski H03S-1 Helicopter crashed while landing on the ship with Rear Admiral Arleigh A. Burke, Commander Cruiser Division Five, and Lieutenant General James A. 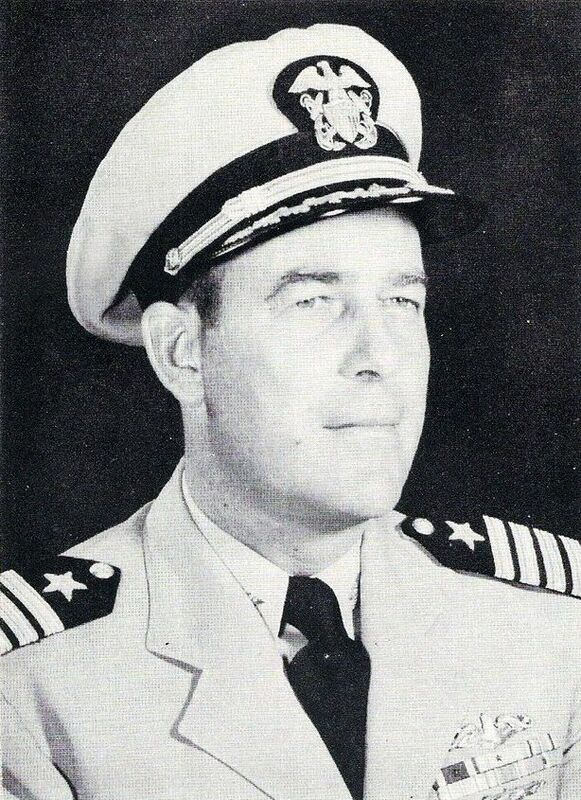 Van Fleet, Commanding General, Eighth Army, aboard, circa June-July 1951. 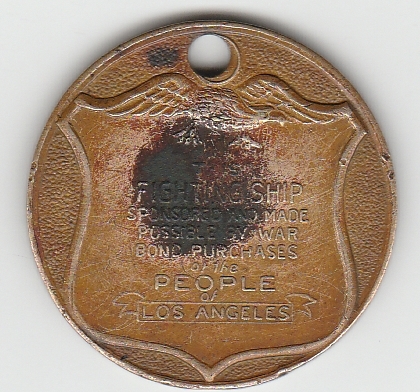 You asked for a description of the helicopter crash on the stern of the USS LOS ANGELES in 1951 to put on the back of your print. 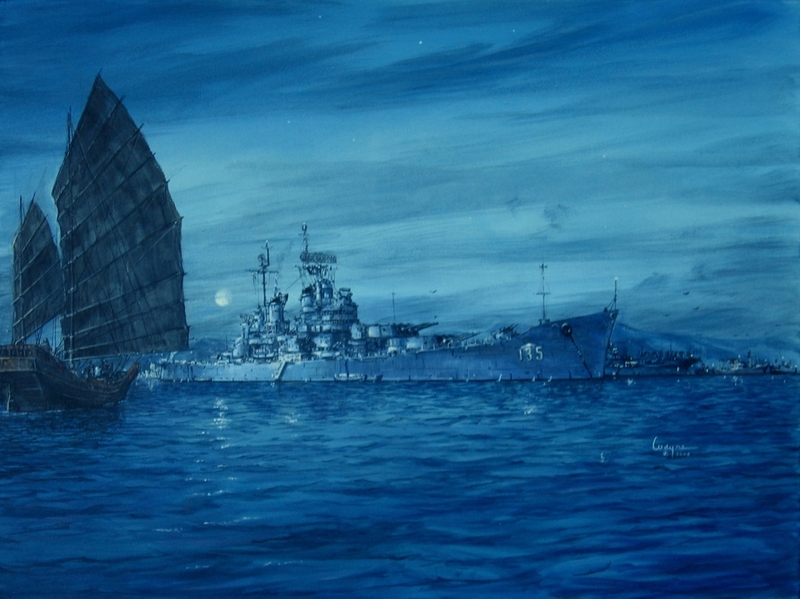 At that time I was Commander Cruiser Division Five which consisted of the LOS ANGELES and a couple of destroyers. We were operating off the East coast of Korea primarily as artillery support for the First ROK Corps who were fighting their way north toward Wonsan. The Corps was commanded by General Paik Sun Yup. I think he was a Major General at the time. 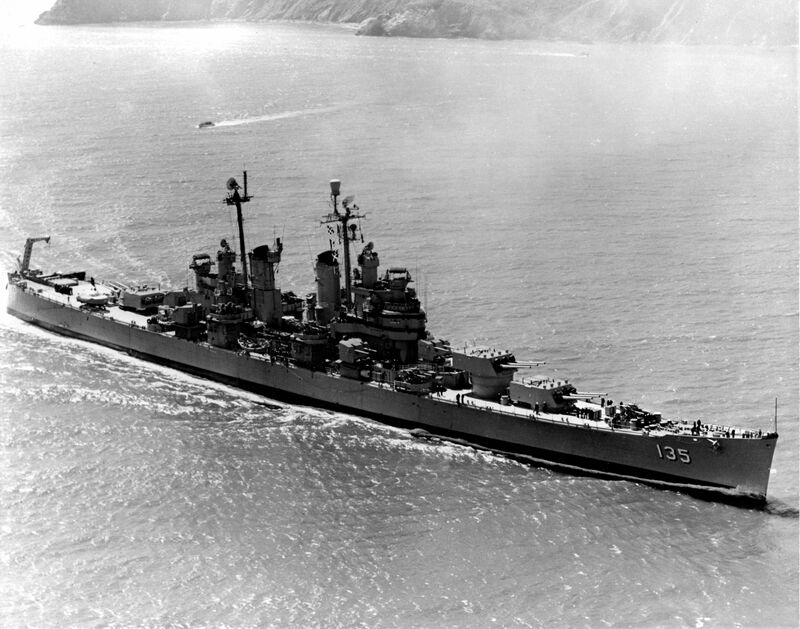 We had other duties too, such as keeping North Korean shipping clear of the area and bombarding targets of opportunity. On this particular morning General Van Fleet was visiting the First Corps Headquarters, and I had gone over in my helicopter to attend the First Corps' briefing. I was the last briefer and briefed as the artillery commander of the First ROK Corps. They didn't have any other artillery but us. When the briefing was over General Van Fleet and I were going to fly the line of combat to determine the enemy positions and the usual things that one looks for on such a mission. 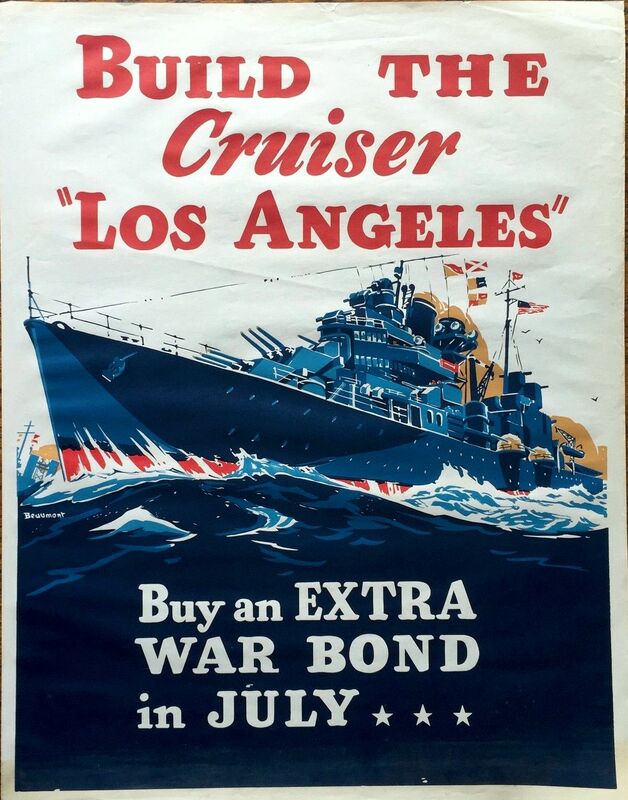 I knew of General Van Fleet's great liking for ice cream, and of course there wasn't any on the beach, so I asked him if he would first like to come aboard LOS ANGELES for a good dish of ice cream. The helicopter pilot was the AP. 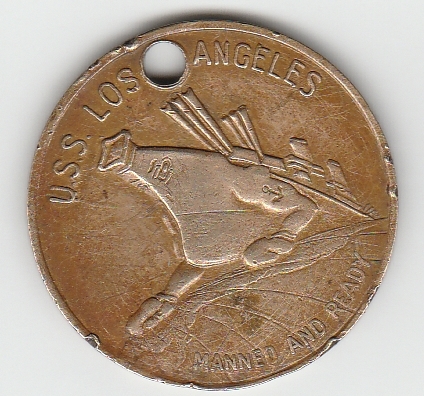 When he started to land in LOS ANGELES he must have become excited by having so much rank in the helicopter and approached the side of the ship too low. Of course the variation in air pressure when the helicopter got over the edge of the ship twisted the helicopter backwards and over on its side, and she crashed real good. The helicopter was dangling on the life net trying to make up its mind whether it wanted to fall overboard or not. Of course there was gasoline all over everything. The crew in the ship pulled it aboard. This took about one minute, I guess. General Van Fleet was on the right side of the helicopter and I was on the left side on the bottom. General Van Fleet asked immediately after we crashed, "What do we do now?" I told him to kick the damned window out on his side and not step on my groin anymore. He crawled out first, or course, and then I followed him. When we got on deck I didn't know what to say or how to apologize, so I asked him what he wanted on his ice cream. He said "pineapple," and then thoughtfully added that the AP must be shook up a bit and wouldn't it be a good idea for him to have some ice cream too, which he did. Since that was the only helicopter we had, the next question was how to get General Van Fleet back on the beach. We sent a radio to the First ROK Corps headquarters and asked that he be met with a jeep on a certain part of the beach. I went in with him in the motor whale boat. On the way in I asked the coxswain how much experience he had had landing through a surf. He said he had been ordered as coxswain of the boat about a week before and had never been through a surf. I then asked the boat officer, an Ensign, if he had had any experience in landing through surf. 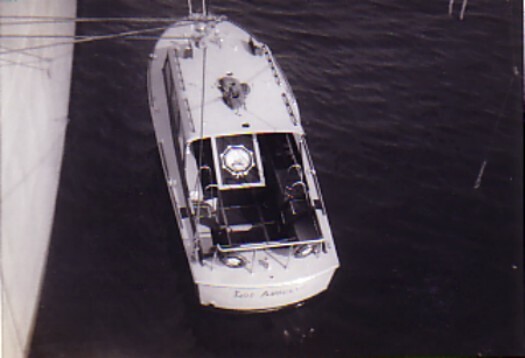 He said no, he was assigned as boat officer because he was junior officer of the deck. 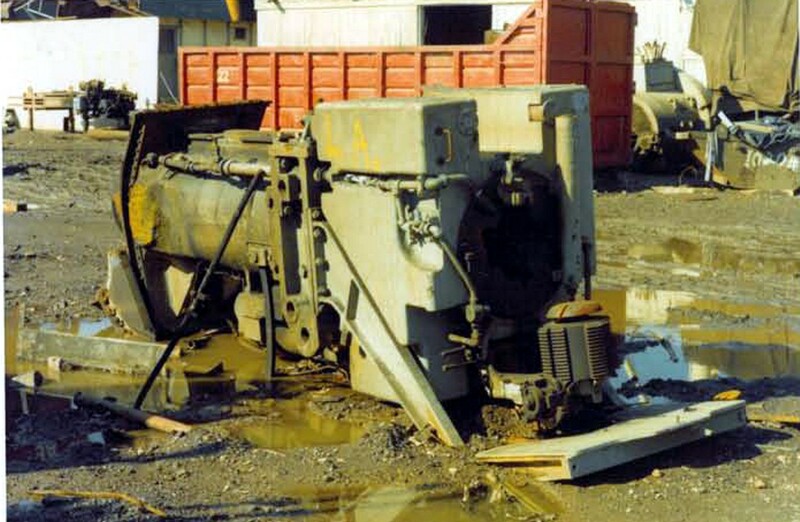 The bow hook and the engineer had equal experience. 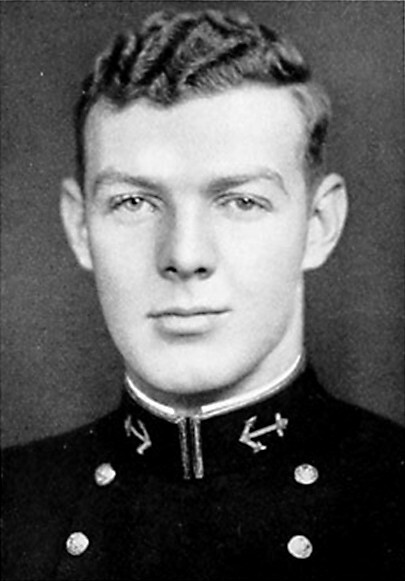 I then told General Van Fleet that he was going to be the first General of the Army in a long time to be landed through a surf with a Rear Admiral as coxswain. I then took my position as coxswain. The surf was pretty high, but we made it all right without incident. After I had landed General Van Fleet I waited and waited and waited until he got out of sight in his jeep before I tried to bring that boat out through the surf again, because I wasn't so sure I could do it. However, it worked out all right. I have just returned from Europe and am about to take off for the Far East. I'll be back near the end of April. 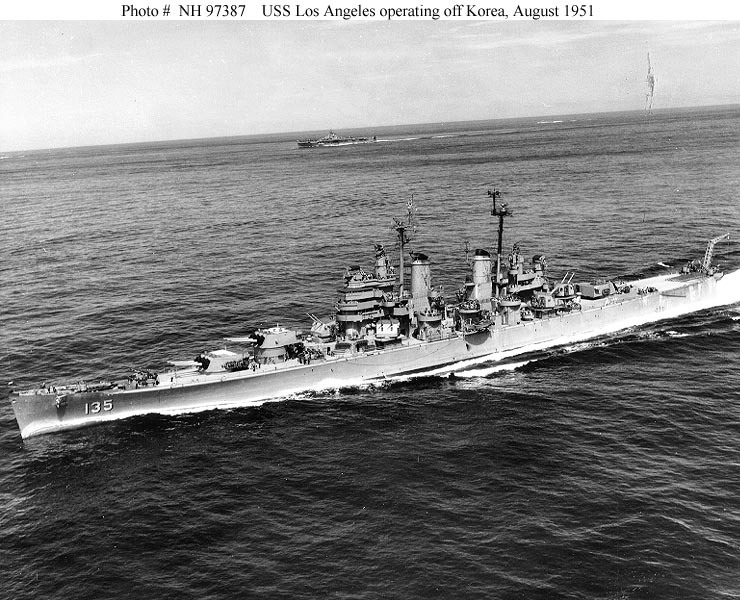 USS Los Angeles (CA 135) Operating off Korea with Task Force 77, August 1951. Official U.S. Navy Photograph, from the collections of the Naval Historical Center #NH 97387. 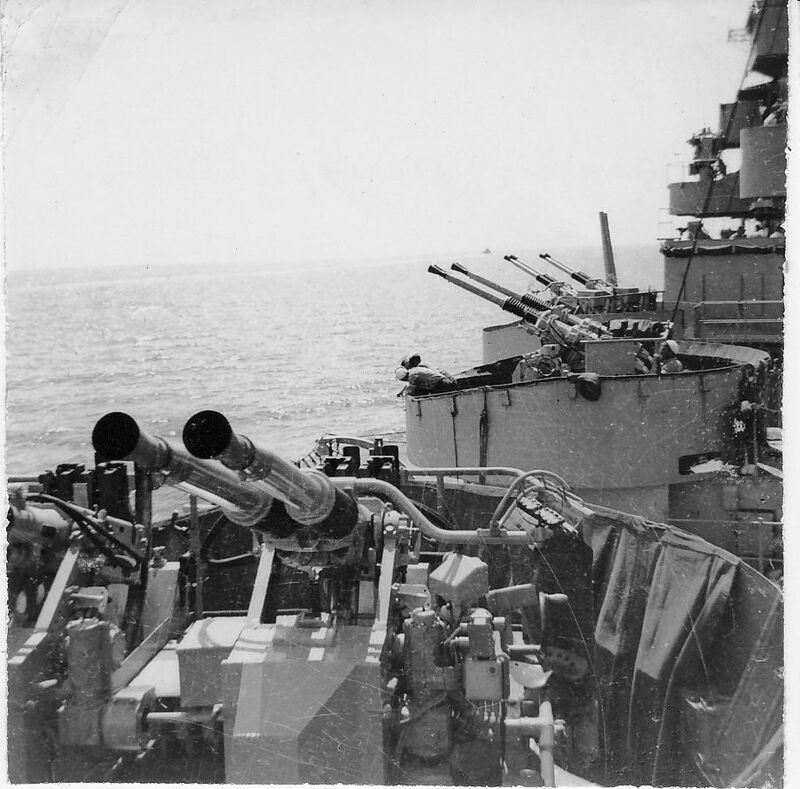 Looking forward: port quad 40mm mounts, 1951. From the N.A. "Stretch" Brown collection. Photo by N.A. "Stretch" Brown, Gunners Mate 3rd Class aboard Los Angeles. 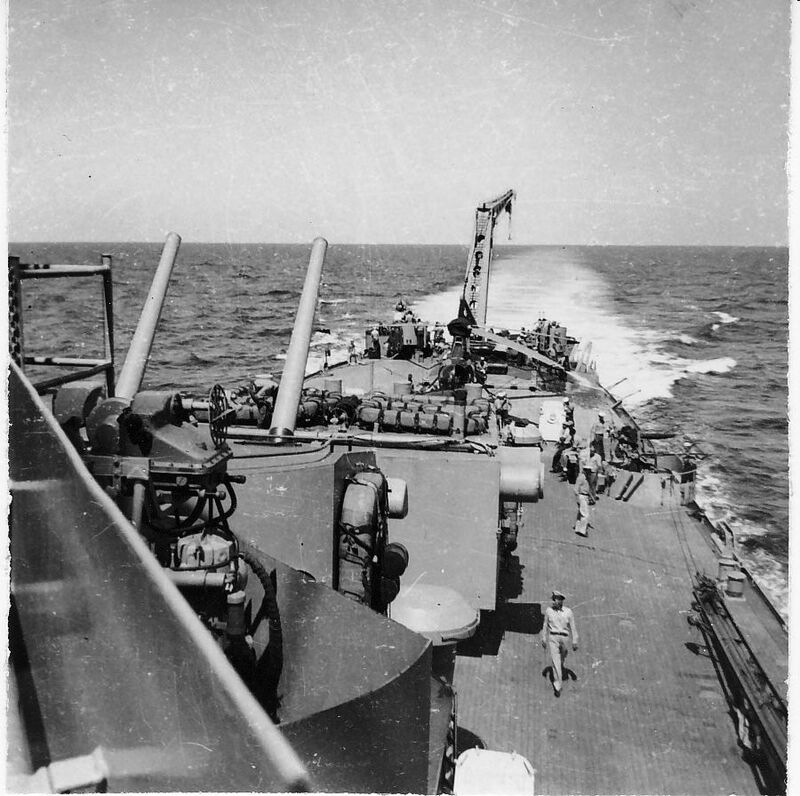 Looking aft: mount 56 & turret 3, 1951. From the N.A. "Stretch" Brown collection. 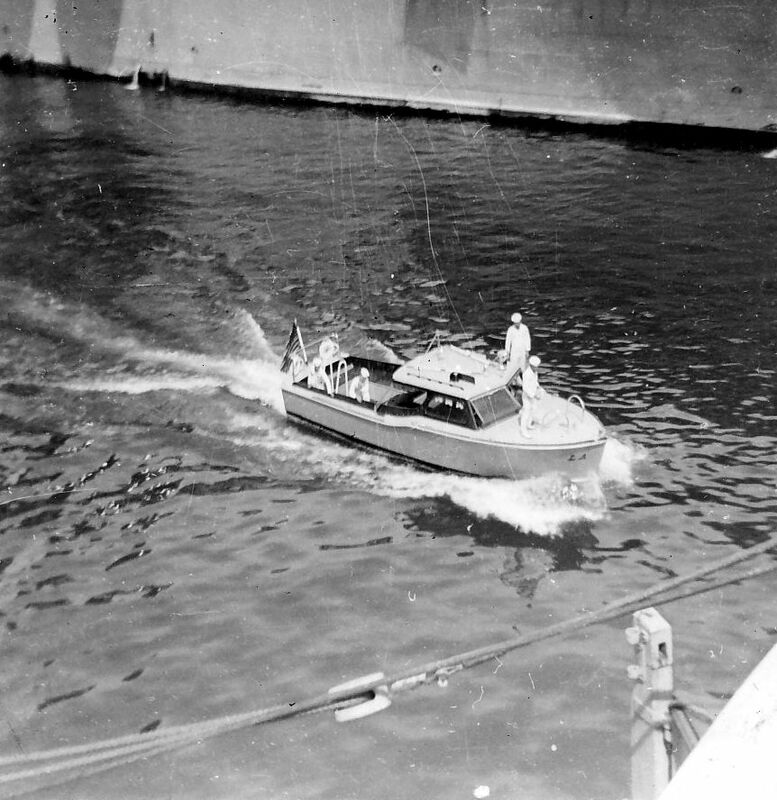 Officers' boat, Yokosuka, September 1951. From the N.A. "Stretch" Brown collection. 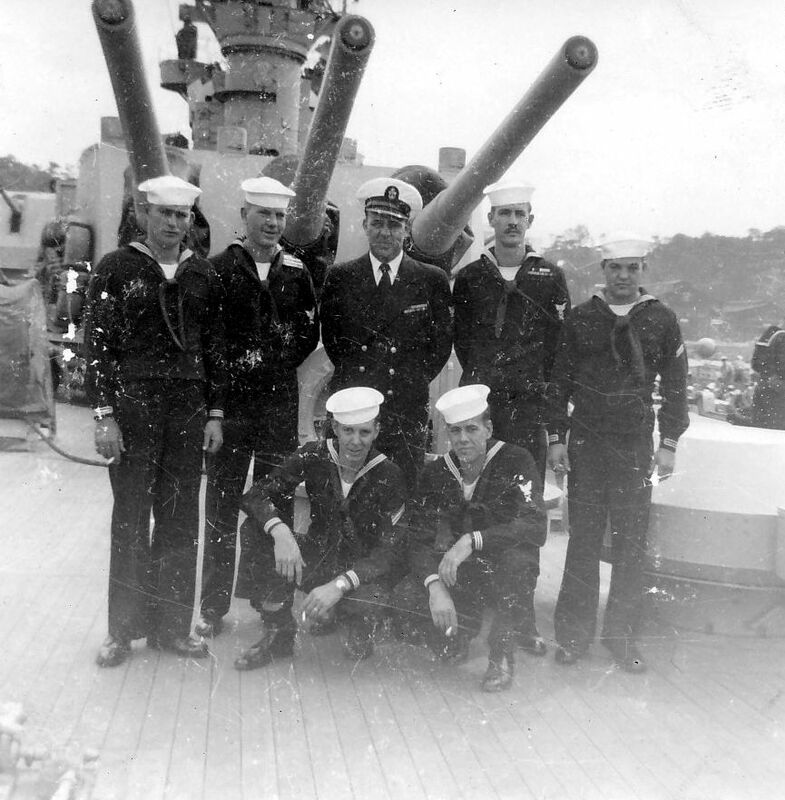 Gunners Mates, Yokosuka, September 1951. 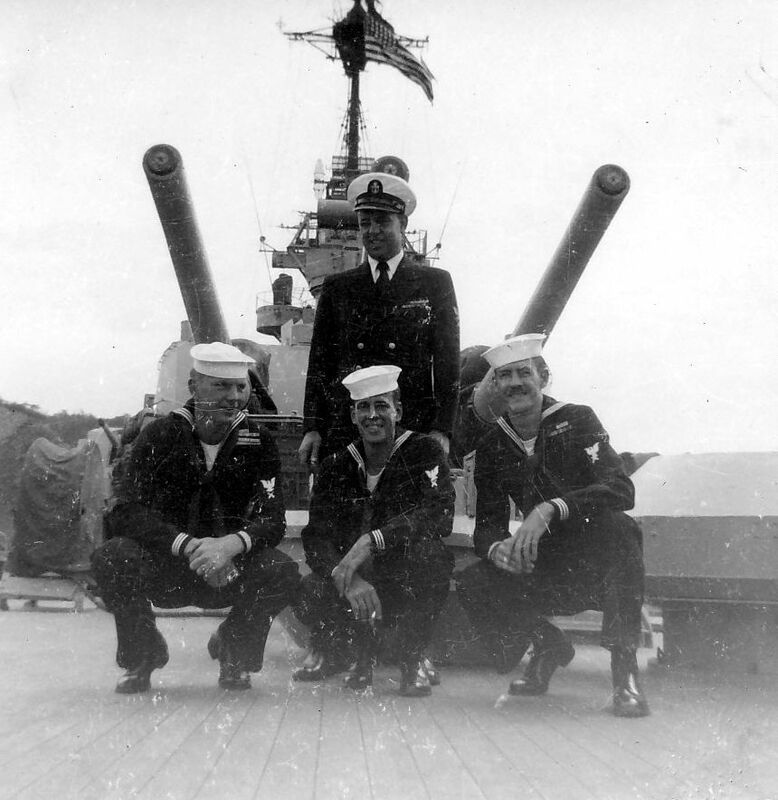 Captain's Gig and Gunners Mates, September 1951. From the N.A. "Stretch" Brown collection. 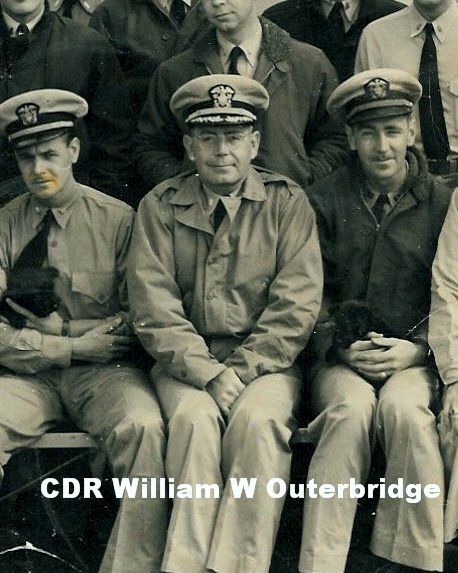 Chief Kohler and Gunners Mates, l-r: Squires, Basinett, Holland, Yokosuka, September 1951. From the N.A. "Stretch" Brown collection. 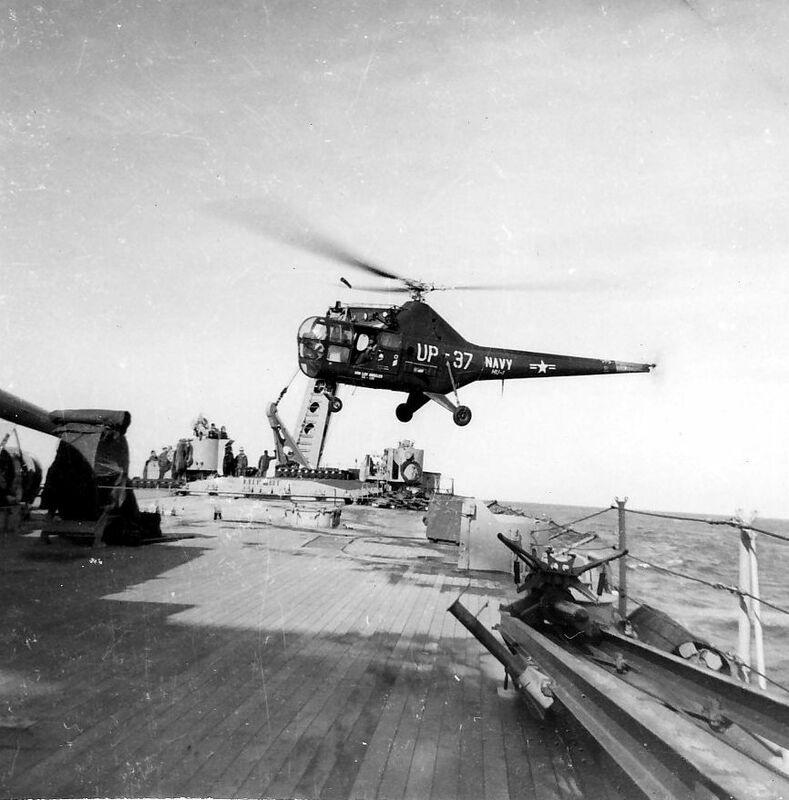 Helicopter landing on fantail, Korea, 1951. From the N.A. "Stretch" Brown collection. 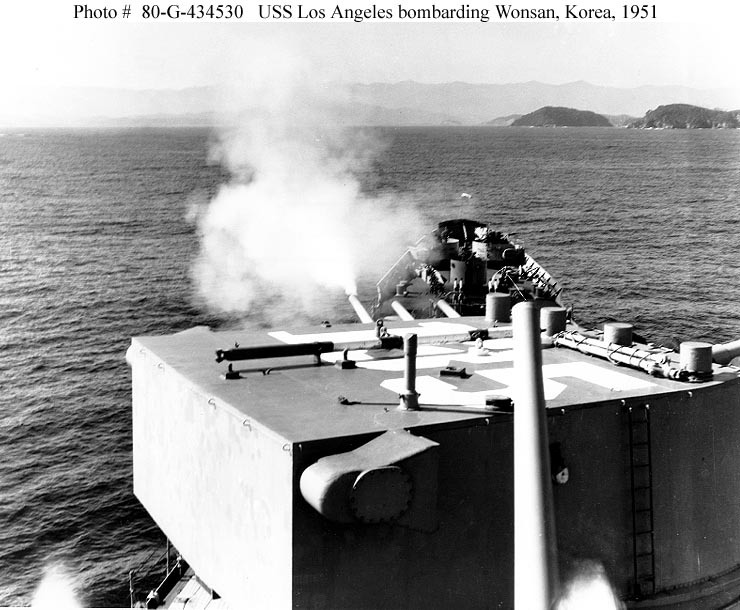 USS Los Angeles (CA 135) Firing her forward 8-inch guns on enemy targets at Wonsan, North Korea. Photograph is dated 15 October 1951. 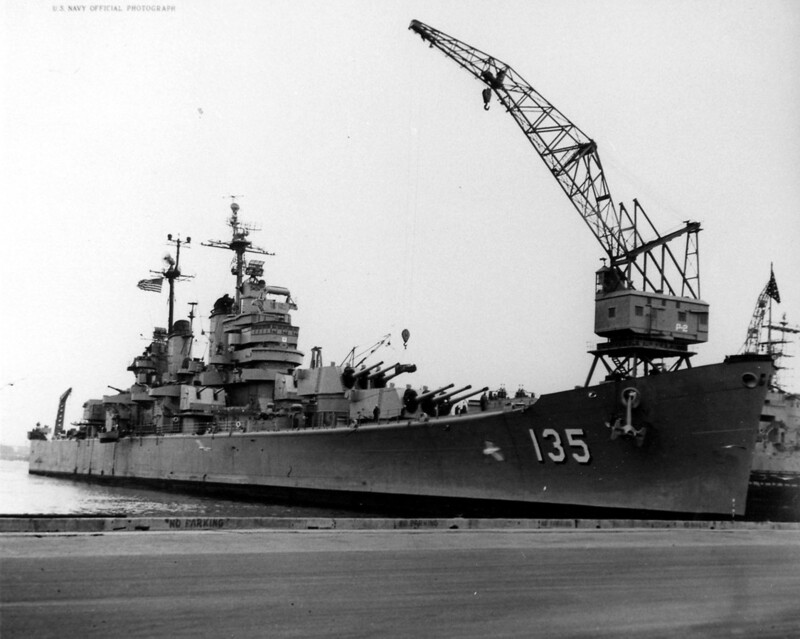 Note ship's hull number ("135") painted atop turret # 2. 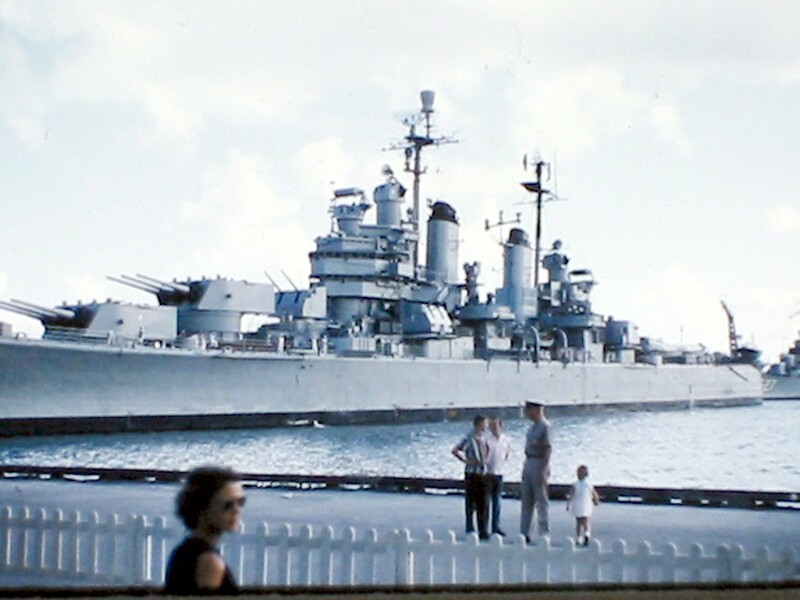 Official U.S. Navy Photograph, now in the collections of the National Archives #80-G-434530. 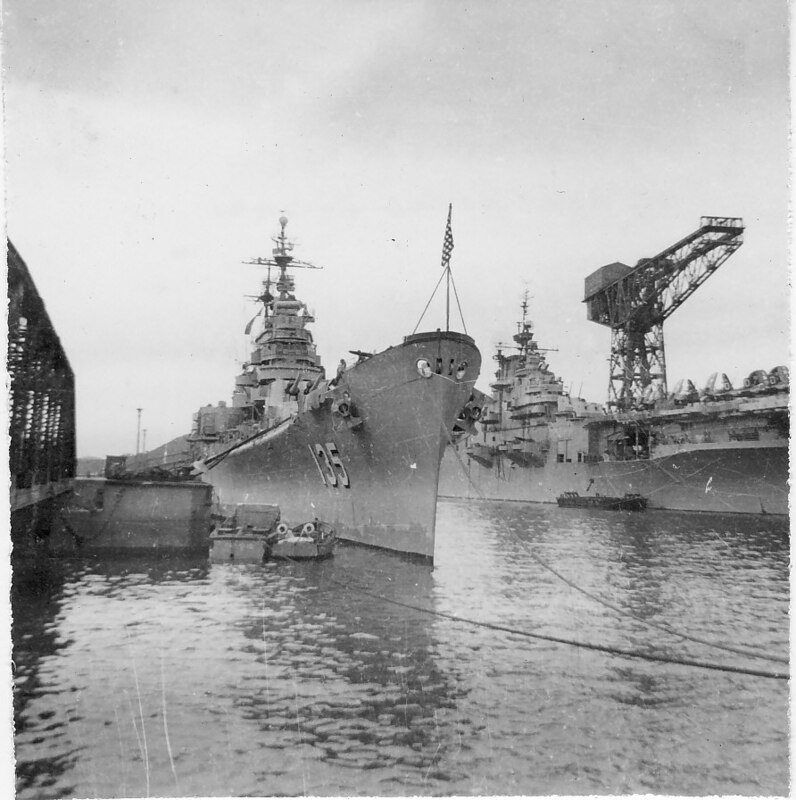 Yokosuka, October 1951. From the N.A. "Stretch" Brown collection. 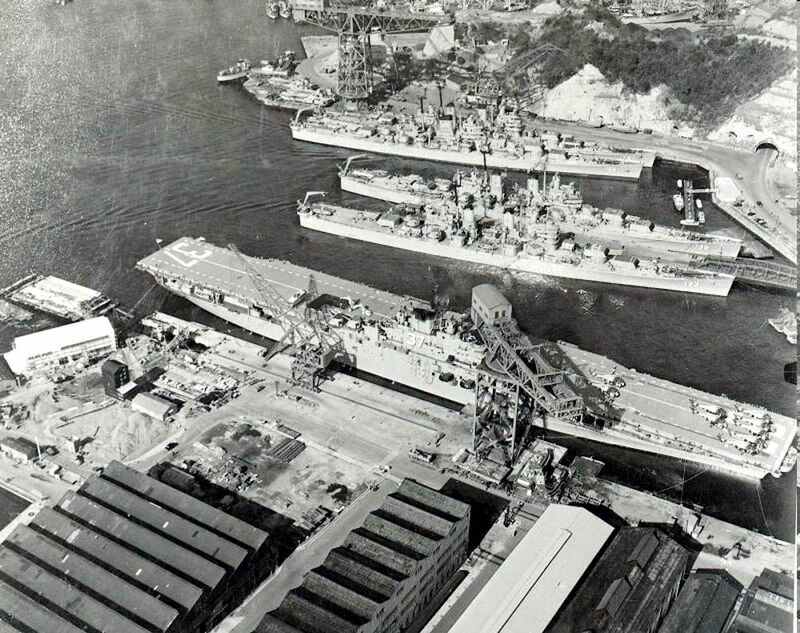 USS Los Angeles (CA 135) and USS Bon Homme Richard (CV 31) moored at Yokosuka, Japan, October 1951. 6th division, Yokosuka, Japan, November 1951. From the N.A. "Stretch" Brown collection. 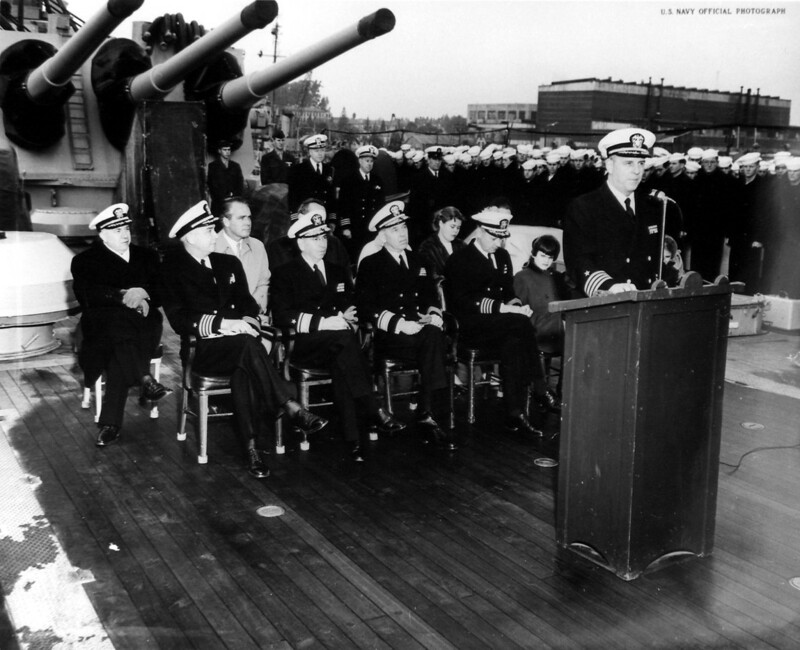 Change of Command ceremonies aboard USS Los Angeles (CA 135) at Mare Island on 9 January 1952. Capt. Benjamin F. Tompkins left assumes command of the USS Los Angeles at Mare Island Naval Shipyard, Capt. 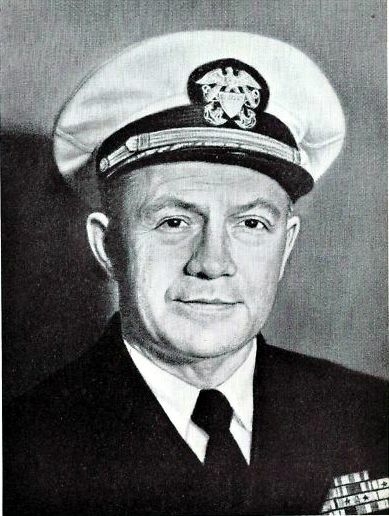 Tompkins succeeded Capt. R. N. McFarlane. Seated at the ceremonies are left to right Capt. 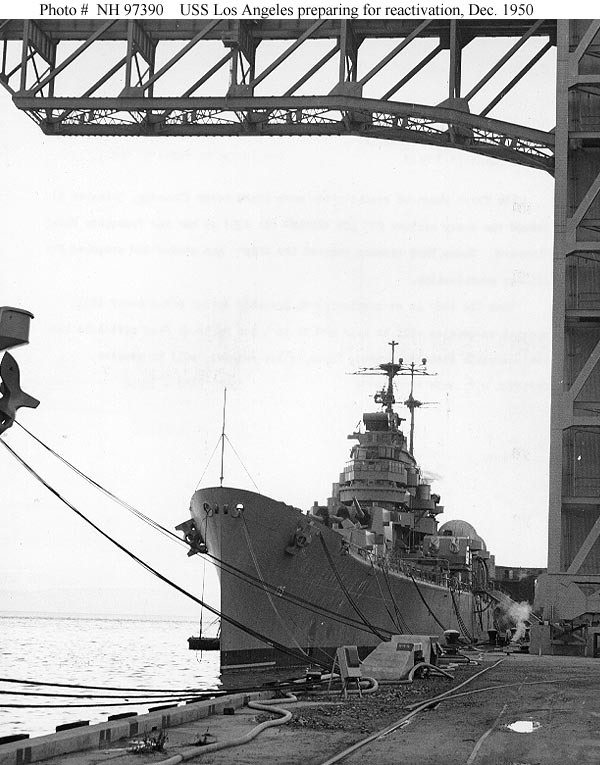 McFarlane; RADM B. E. Manseau (Shipyard Commander); RADM Leon S. Fiske (Mare Island Area Commander), Capt. Alexander McDill (CO USS Juneau); Judy Kinney (niece of Capt. Tompkins); Mrs. Tompkins and Karen Kinney; Judy's twin sister. Seated immediately in the rear of Mrs. Tompkins is Mrs. W. A. Kinney, mother of the nine year old twins. Vallejo Naval and Historical Museum. 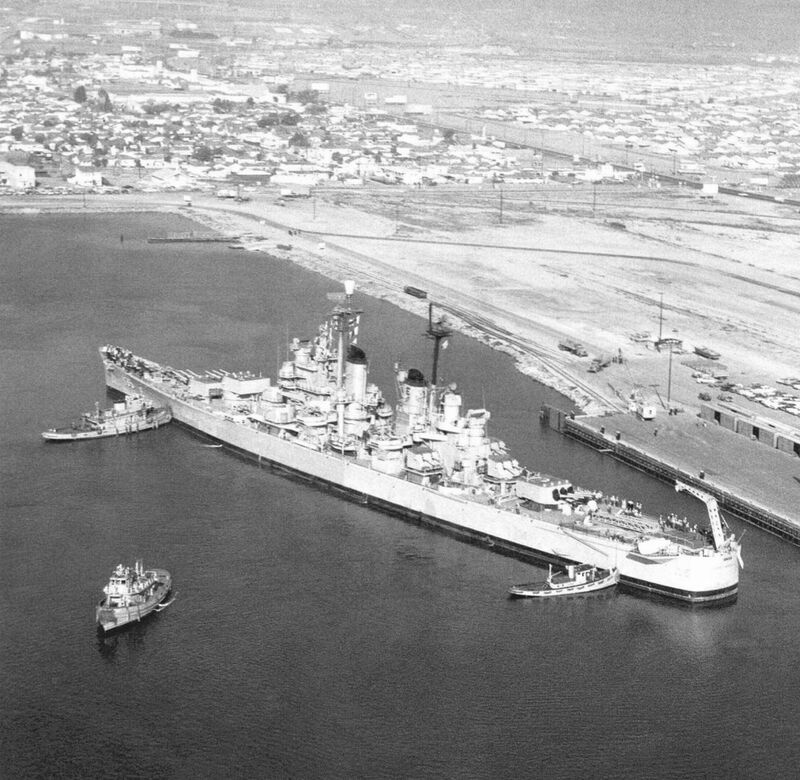 USS Los Angeles (CA 135) berthed at Mare Island on 5 January 1952. 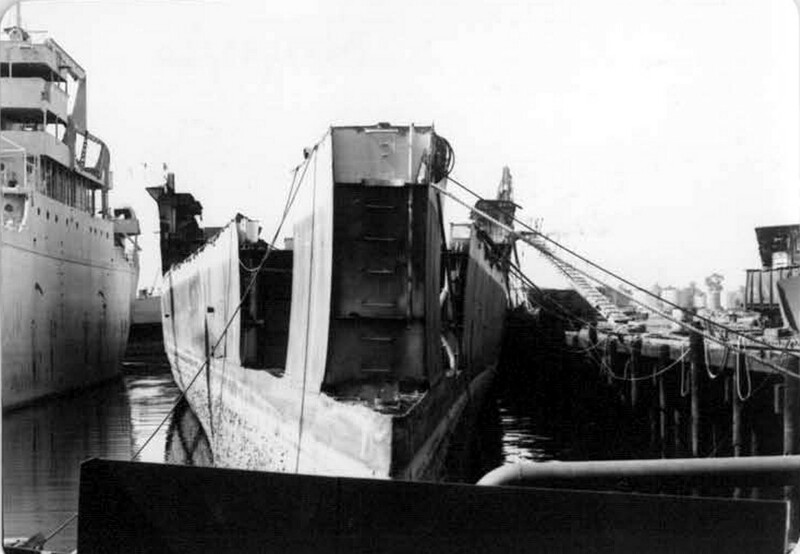 She was under repair at the yard from 3 January to 28 April 1952. 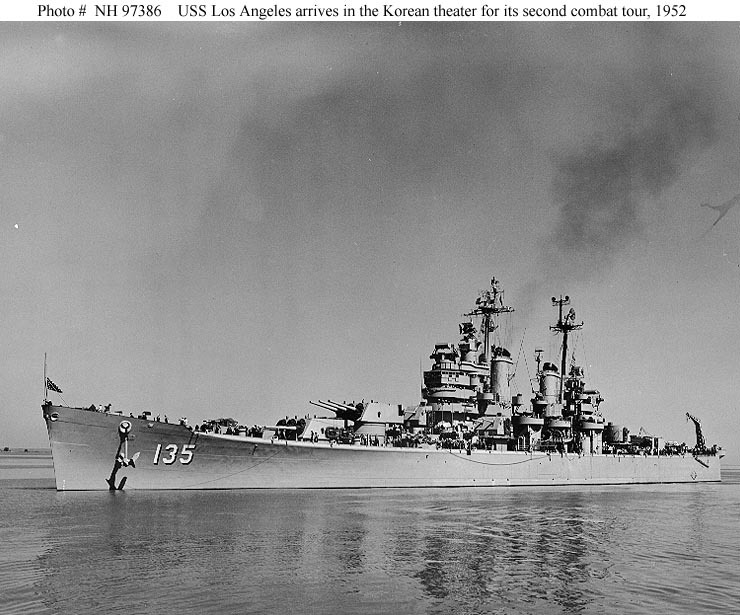 USS Los Angeles (CA 135) "Returns to the Korean theater for its second tour of combat duty with UN Naval Forces". 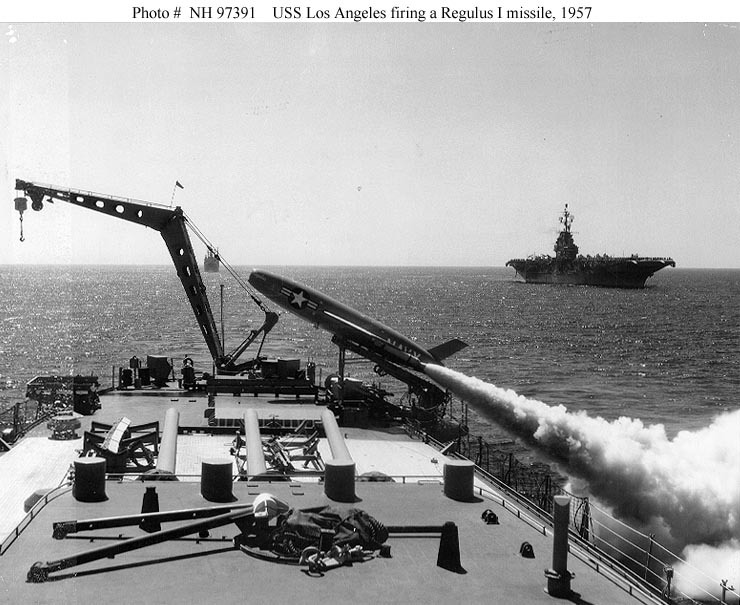 Text quoted from the original picture caption, released by Commander Naval Forces Far East under date of 13 October 1952. Note that the ship's Jack and National Ensign are flying at half-mast. 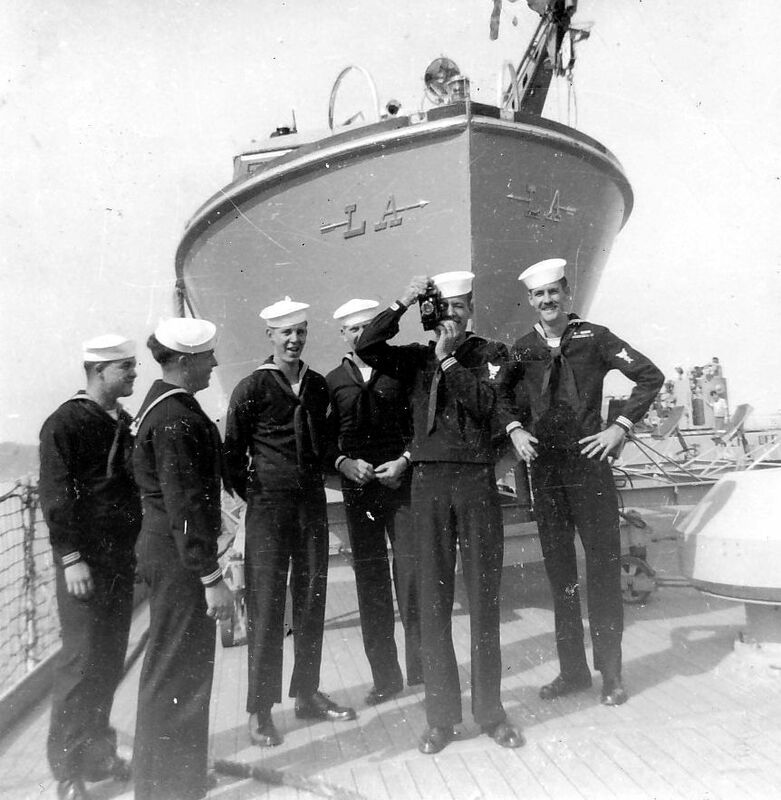 Official U.S. Navy Photograph, from the collections of the Naval Historical Center #NH 97386. 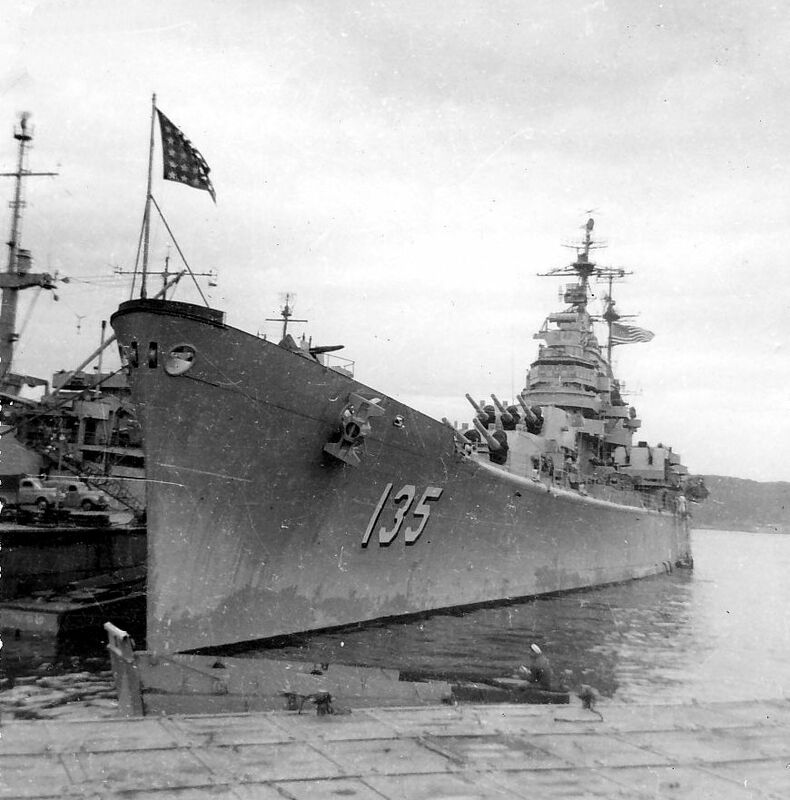 USS Los Angeles (CA 135) at Mare Island 20 July 1954. 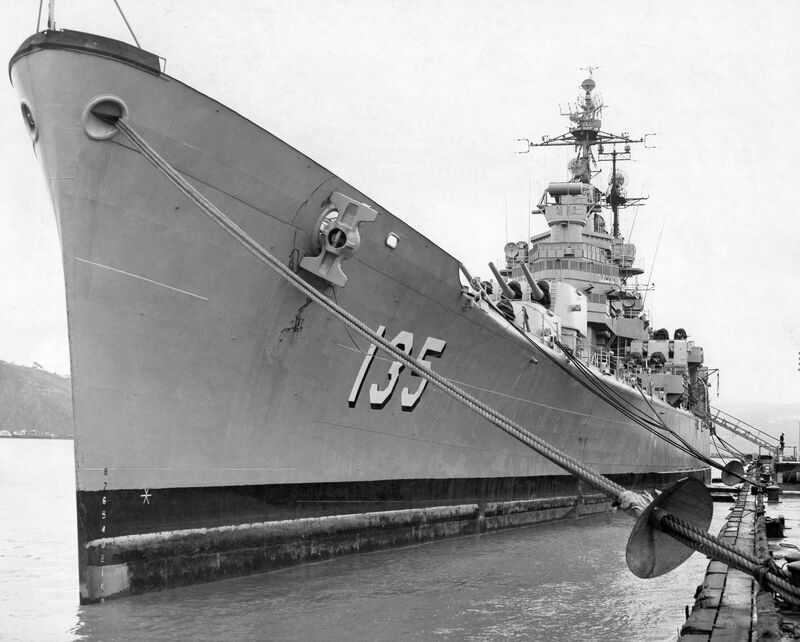 Bow view of USS Los Angeles (CA 135) at Mare Island 5 March 1957. 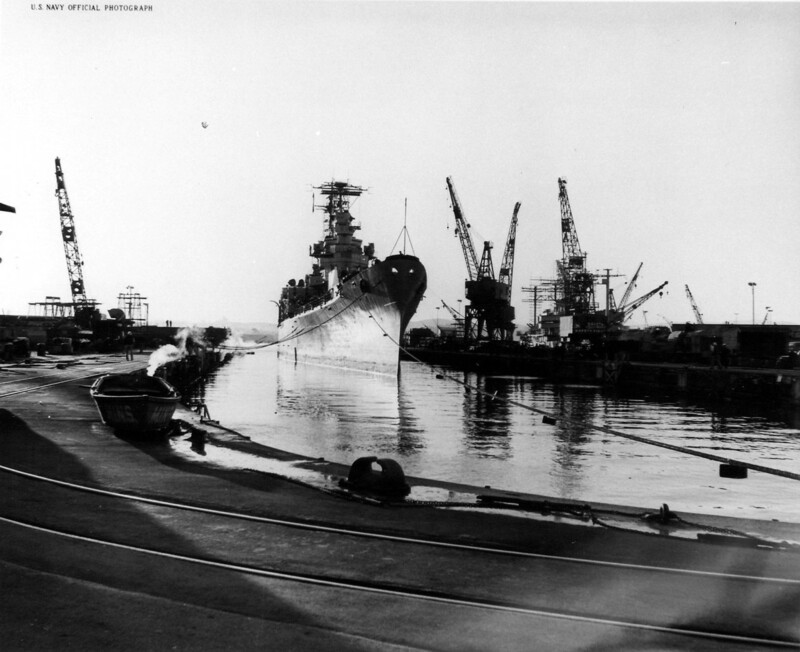 USS Los Angeles enters dry dock #2 at Mare Island on 22 March 1957. 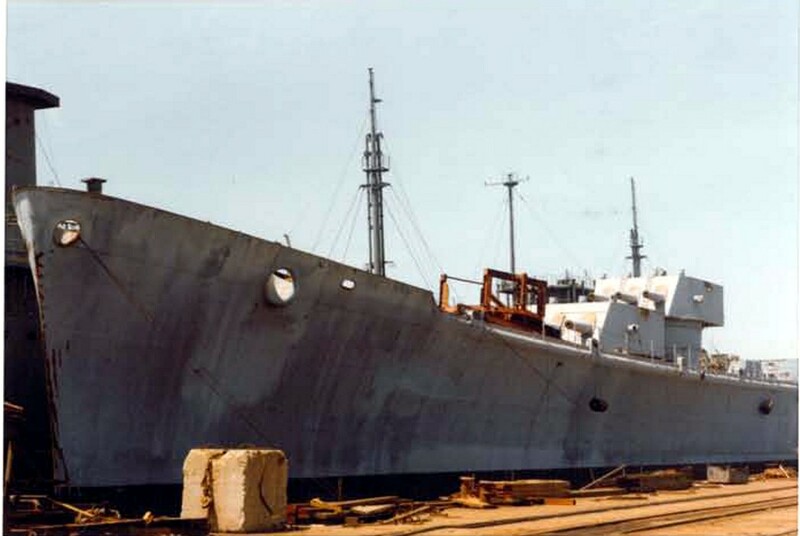 She was under repair at the yard from 3 March to 25 June 1957. 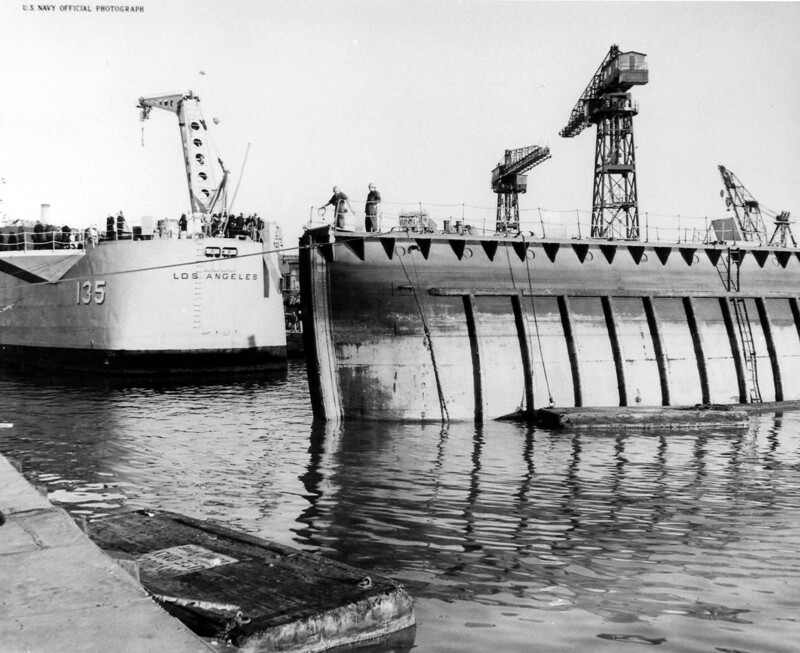 The dry dock caisson is being reposition after USS Los Angeles entered dry dock #2 at Mare Island on 22 March 1957. 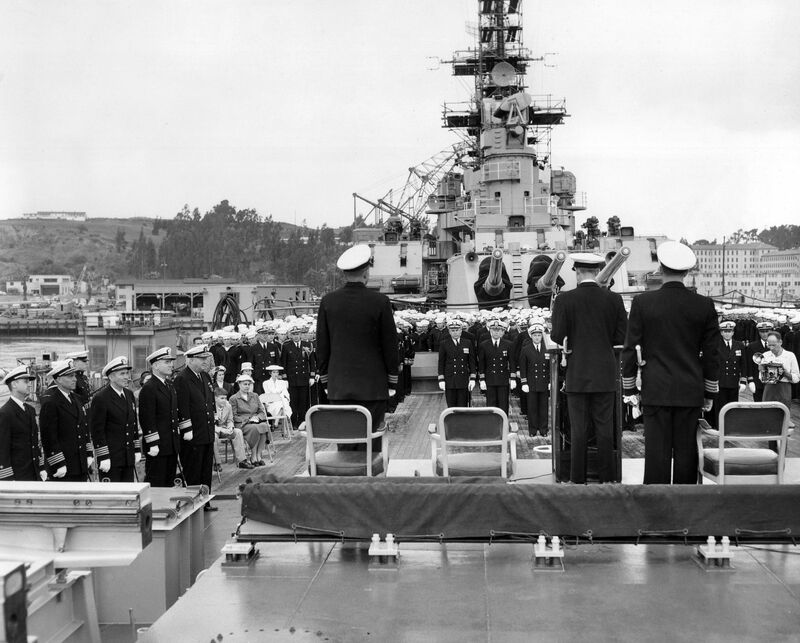 Change of Command ceremonies aboard USS Los Angeles (CA 135) at Mare Island on 3 May 1957. 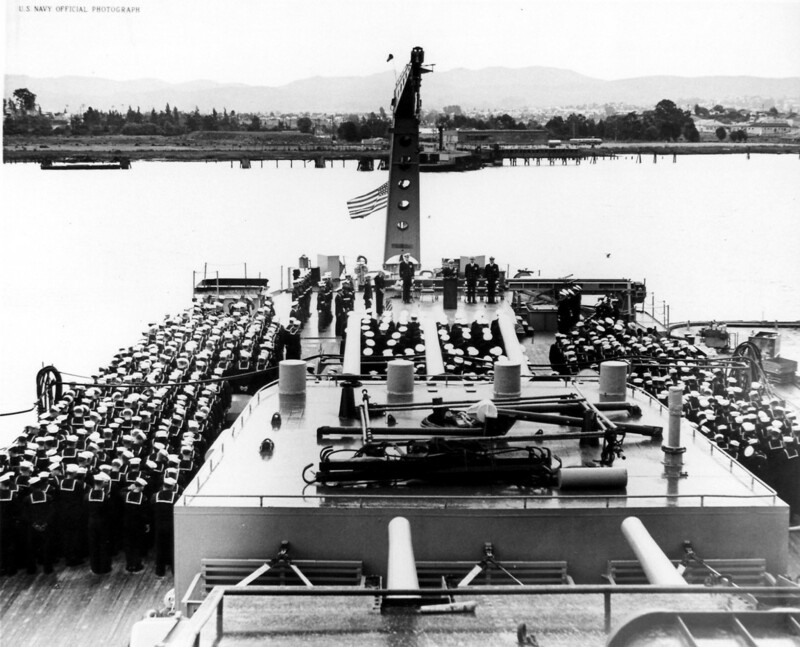 View of the change of command of USS Los Angeles (CA 135) on 3 May 1957 at Mare Island. 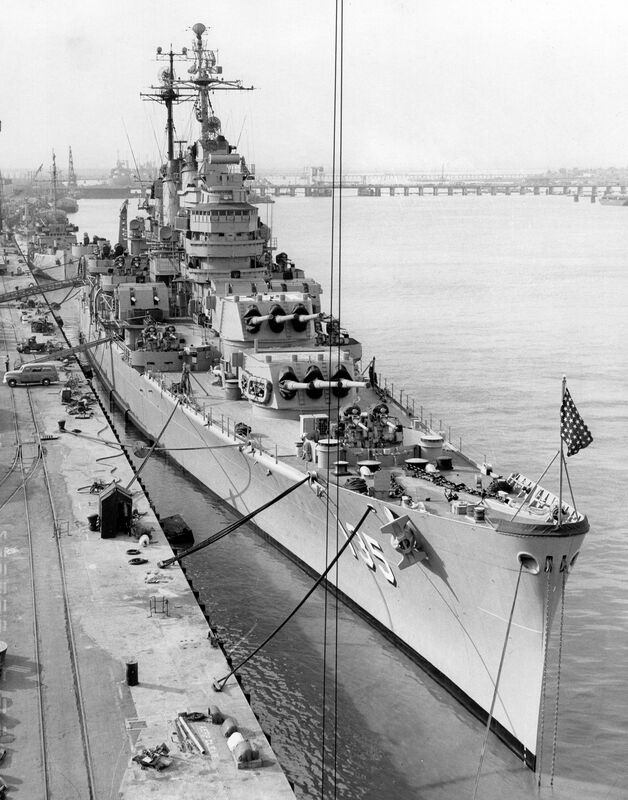 Starboard bow view while entering San Francisco Bay, 11 June 1957. USS Los Angeles (CA 135) "West Coast Cruisers Capable of Nuclear Assault -- A Regulus I boils white smoke from booster charges as it roars away from its launcher aboard the heavy cruiser USS Los Angeles off San Diego. 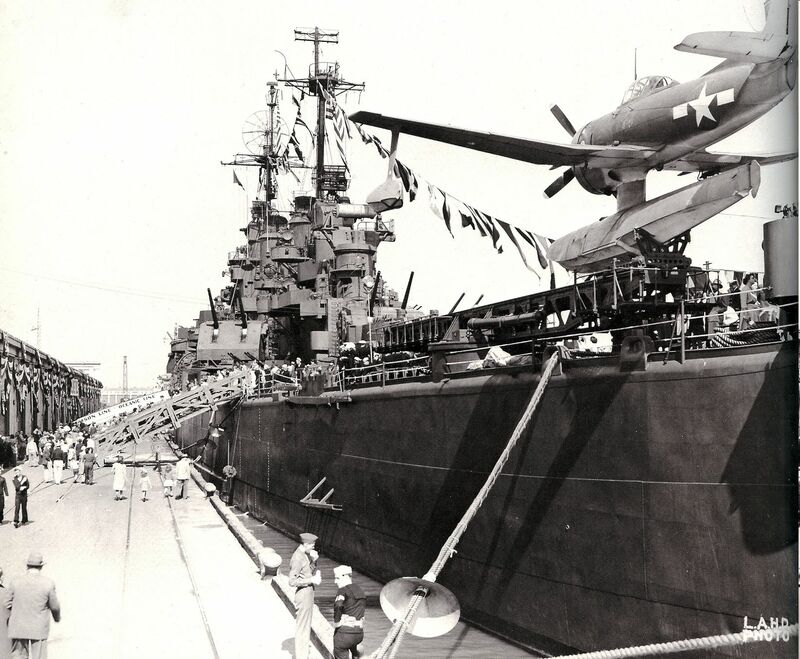 The launch, a routine evaluation 'shoot', was conducted during the time that 600 members of the Institute of Aeronautical Science were embarked aboard the attack carrier USS Ticonderoga (CVA 14), right. The demonstration, which included a 'Terrier' guided missile interception of the Regulus, power exhibition, carrier operations, and a HUK exercise, was highlighted by the Regulus launching. 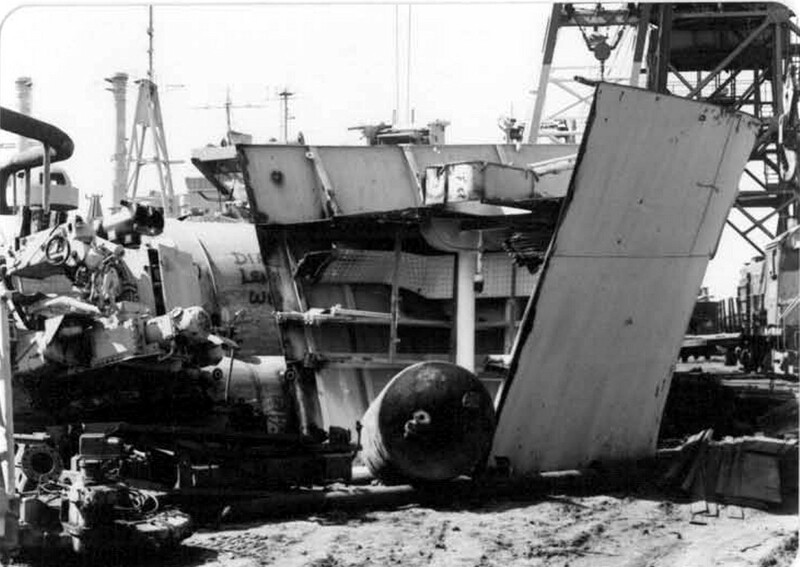 The Terrier was fired at the Regulus from the USS Norton Sound (AVM 1), background, on August 7." 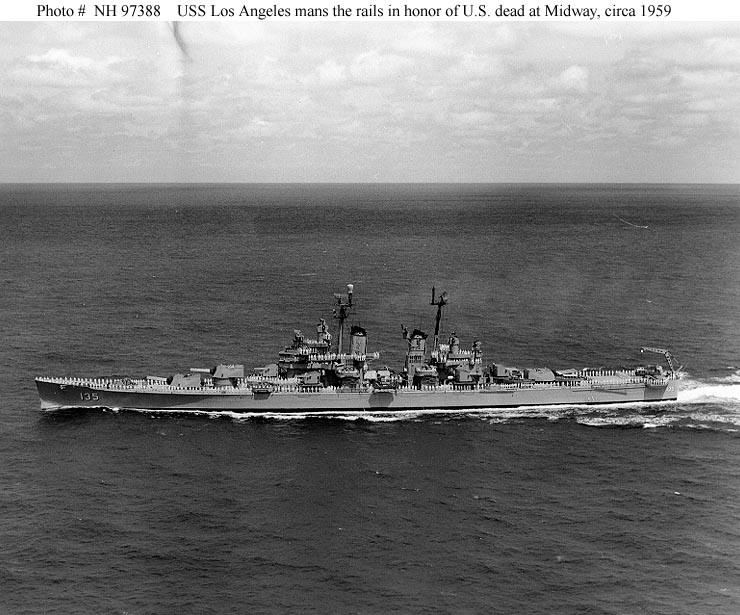 Text quoted from the original photo caption, which was released by Commander, Cruiser-Destroyer Force, U.S. Pacific Fleet, on 9 August 1957. Official U.S. Navy Photograph, from the collections of the Naval Historical Center #NH 97391. 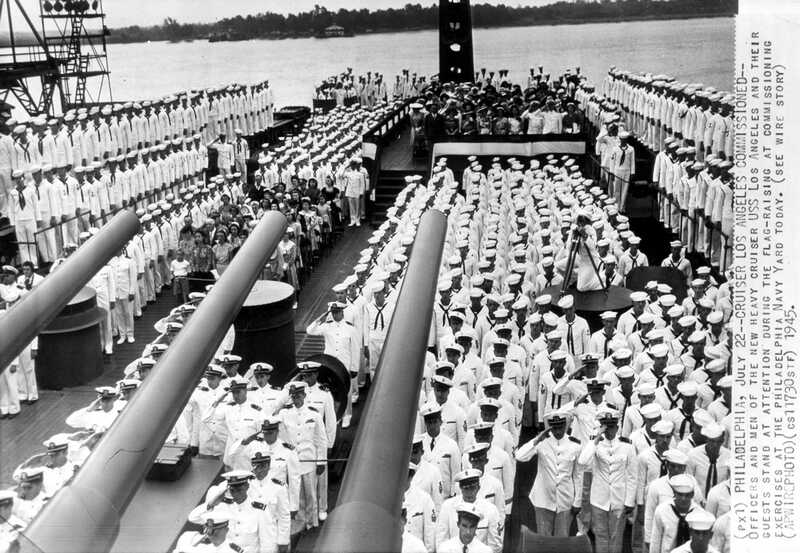 USS Los Angeles (CA 135) "Officers and men of USS Los Angeles honor U.S. dead at Midway" (quoted from the original photo's caption). 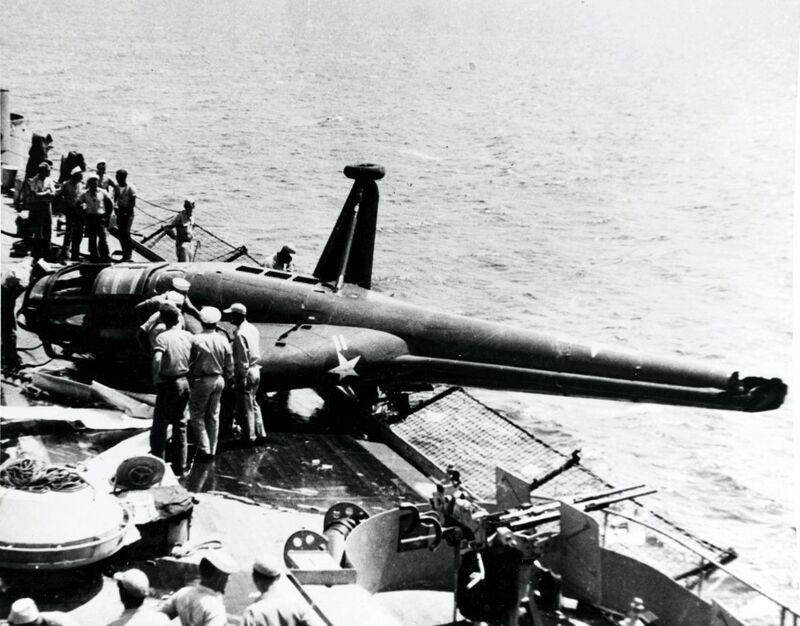 Photo was presumably taken off the Midway Islands. The original print bears a stamped date of 27 April 1959. Official U.S. Navy Photograph, from the collections of the Naval Historical Center #NH 97388. 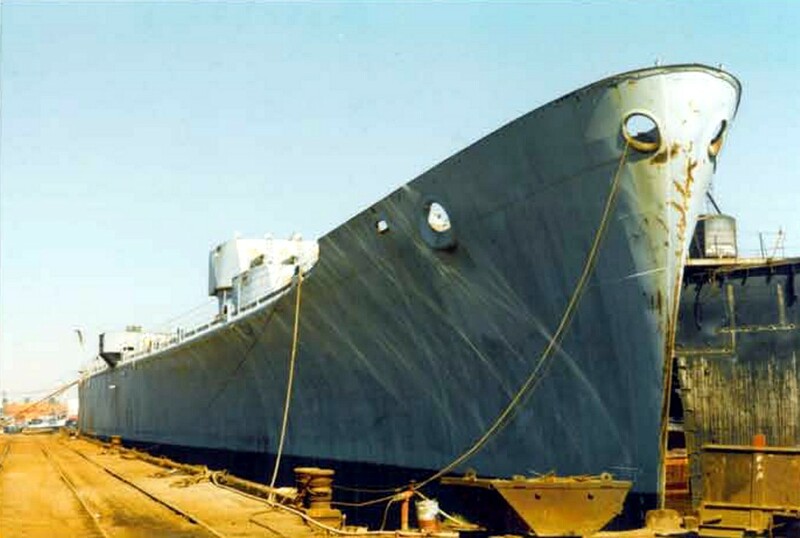 Port bow view while being scrapped. 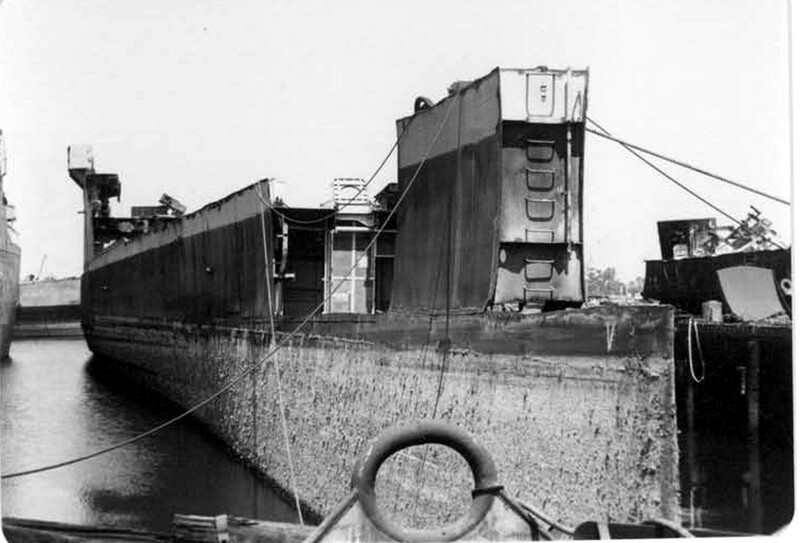 Note the superstructure has already been removed and the barrels of the two forward turrets cut short prior to removal. What's left of one of the 8"/55 rapid-fire guns after being removed from the turret. Note the breech is open. 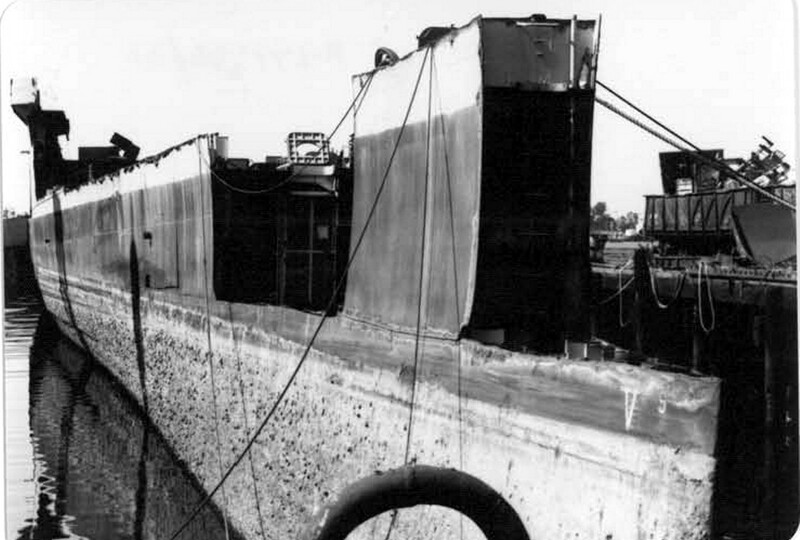 The stern of the Ex-Los Angeles. 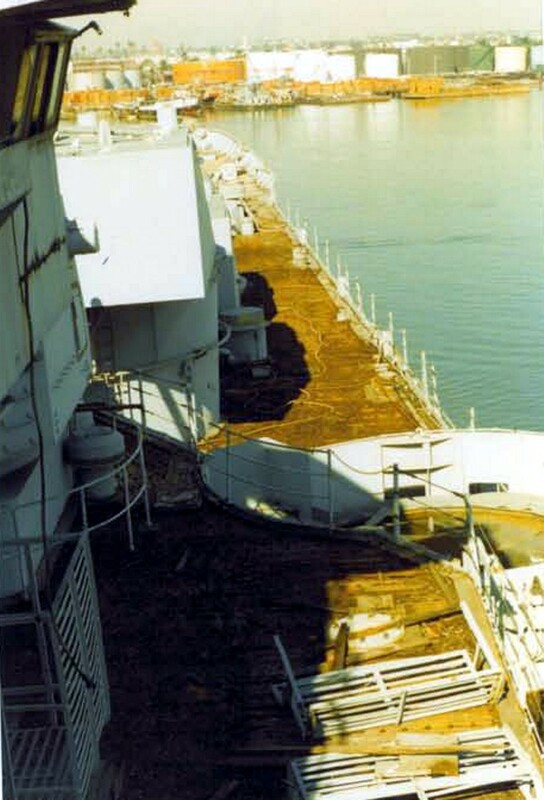 The main deck has already been removed. 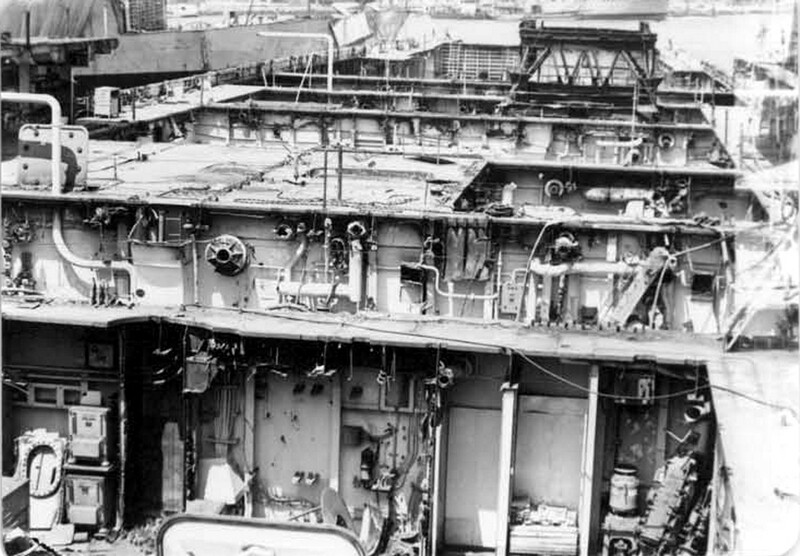 Looking aft with the main deck removed. 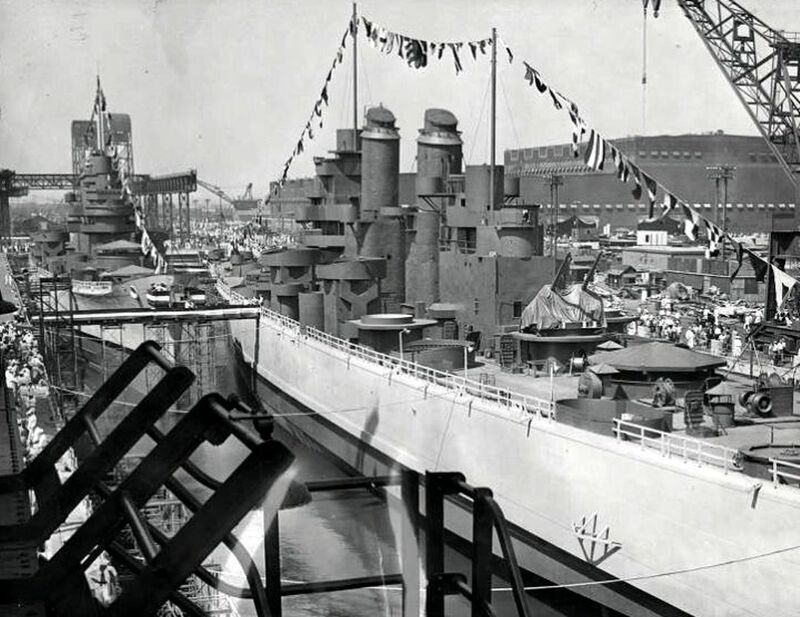 Note the barbette for turret number 3 in the center of the picture. 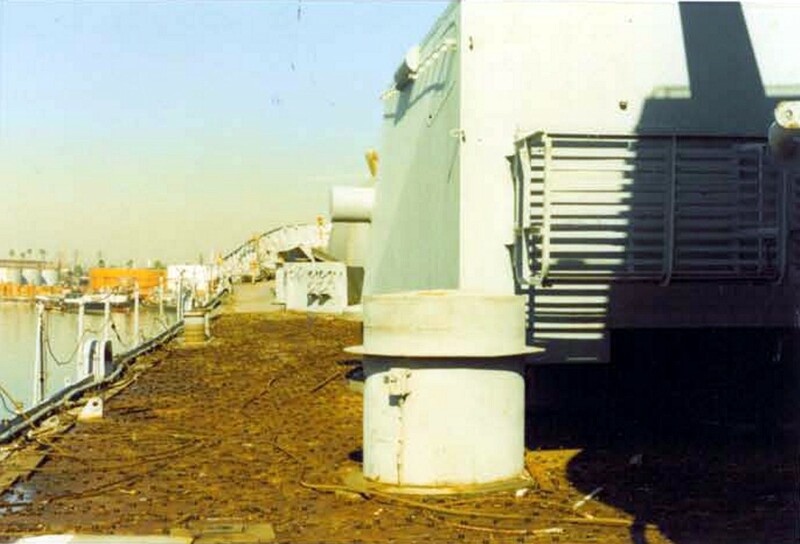 Looking aft from port side midships. 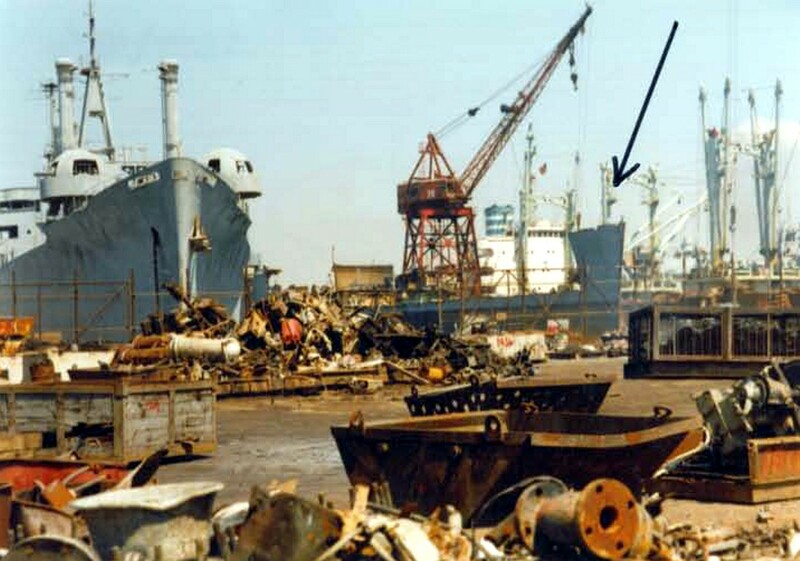 The remains of the after stack are on the left edge of the photo. Looking forward from the area of where turret number 3 was. Looking forward from the port side of turret number 2. 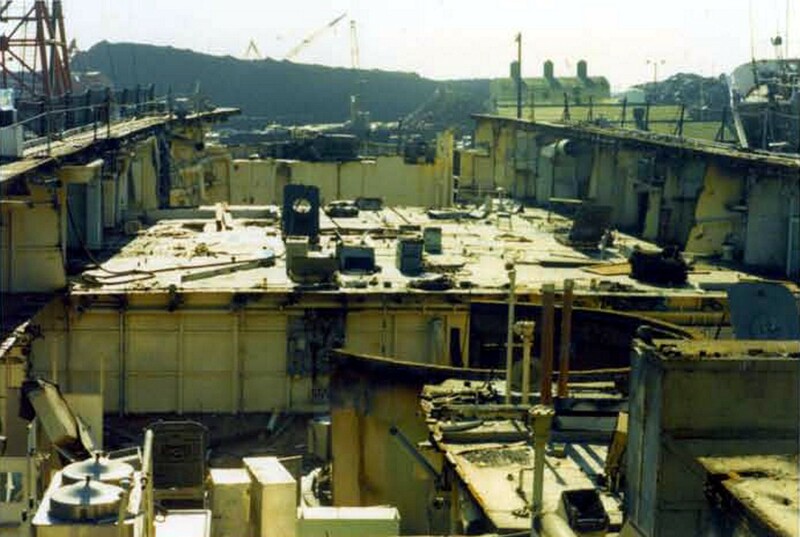 The hull, cut almost down to the waterline in the distance. Looking forward from the starboard signal bridge. 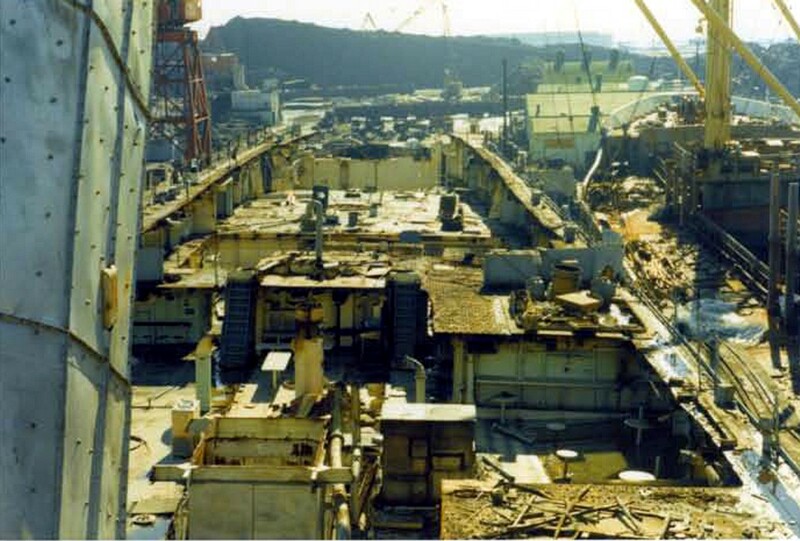 The interior compartments as the decks are cut away. 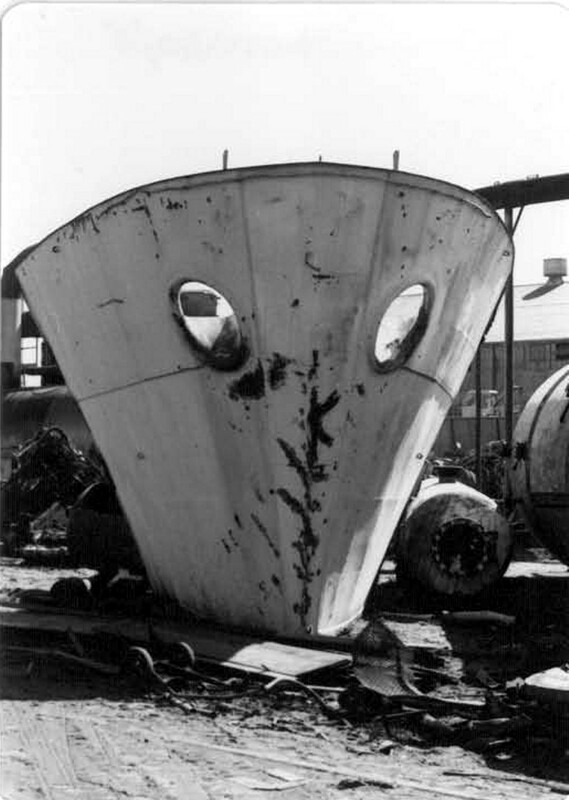 The hull with most of the bow removed. 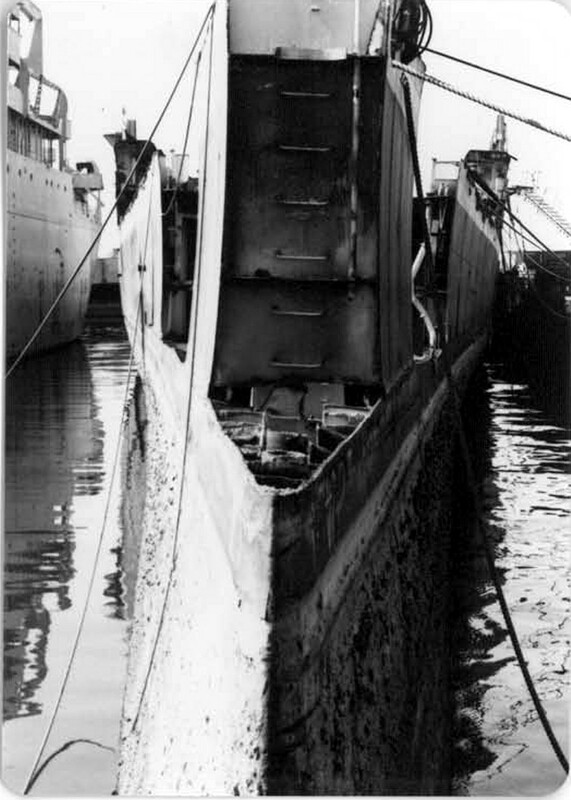 The bow of the ex-Los Angeles, removed. 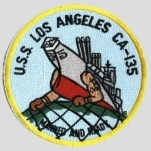 USS LOS ANGELES Web Site. All Pages Copyright © 1996 - 2017 NavSource Naval History. All Rights Reserved.